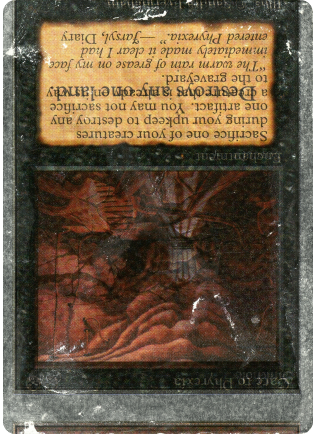 Antiquities back missing layers of colors during the printing process (black is one of them), or interverted colors. The white border doesn't have any Black ink, therefore it is not a test print of a white border. 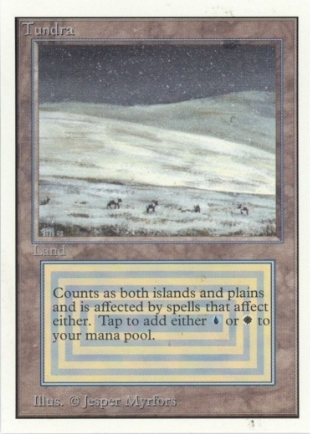 It is interesting to note that a test print of a white border for a Magic back card has indeed been done (this card has black ink on the rest of the card back but not on the border). 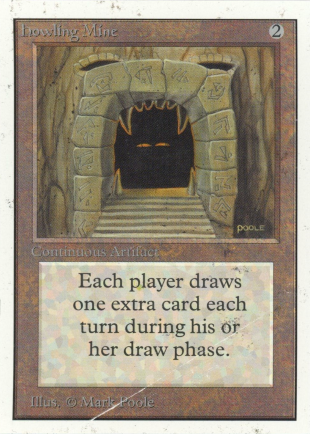 2 Antiquities Uncommons with round corner exist (probably trimmed) and at least 27 Antiquities Uncommons are known to exist with Square corners. 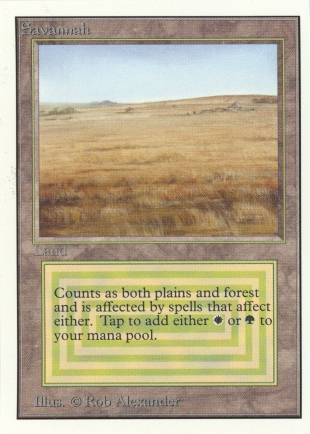 Probability that a full sheet of Uncommons exist is high. 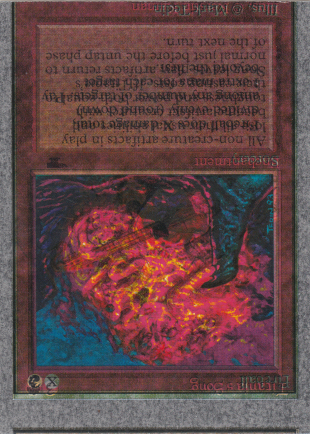 *It looks like they got the Red & Yellow printing plates swapped or maybe had the plates correct but used the wrong ink on each, and then after that, they didn't even bother to print the Black. 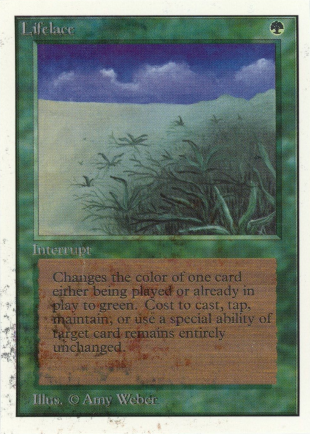 Yellow + Blue make green. 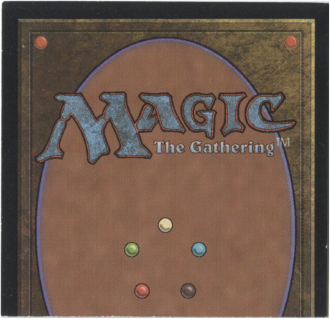 The green mana ball is purple because Yellow & Red have been swapped. 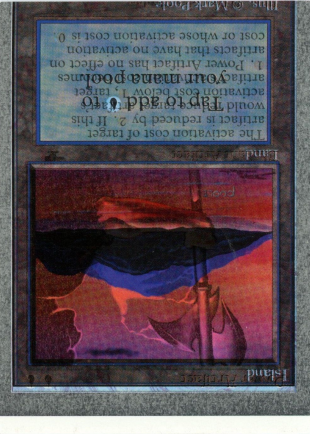 Red + Blue make purple. 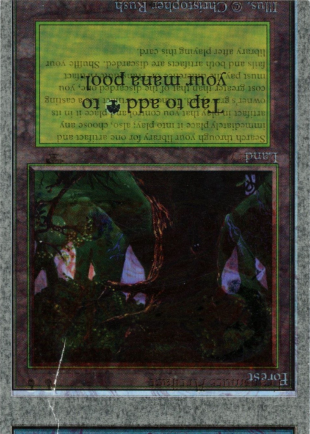 Same issue with the normally purple oval being green. 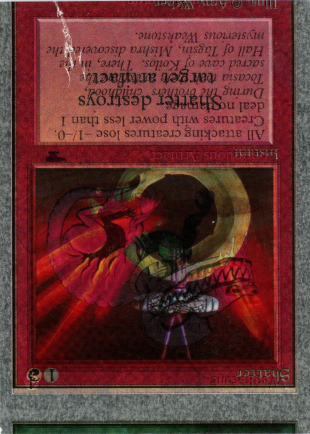 *The red circles in the corners look mostly normal because they are comprised of both Red + Yellow and both colors are still present. 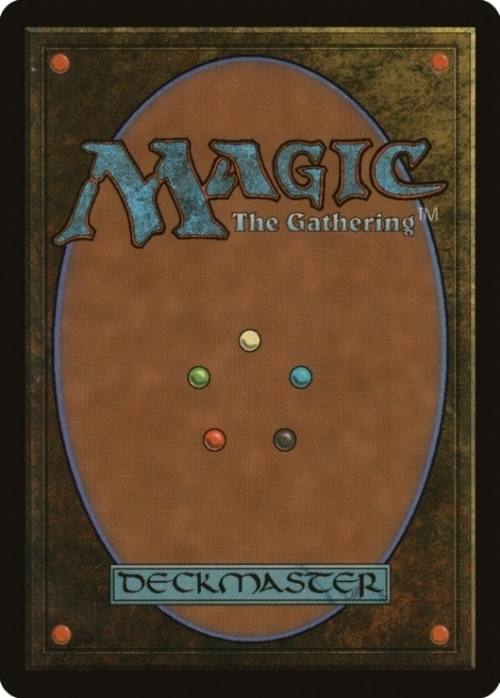 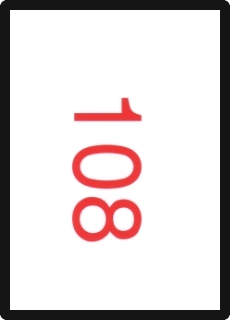 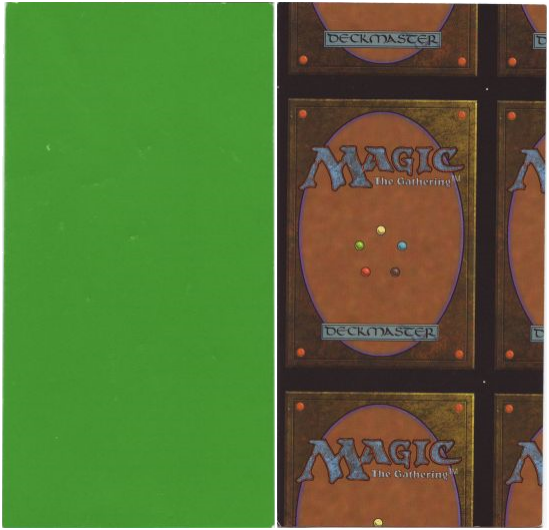 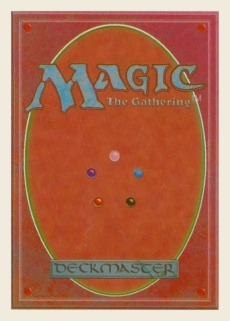 Same with the red outline around "Magic"
*The white mana ball is normally comprised of Yellow dots with some Red dots highlighting the upper right. 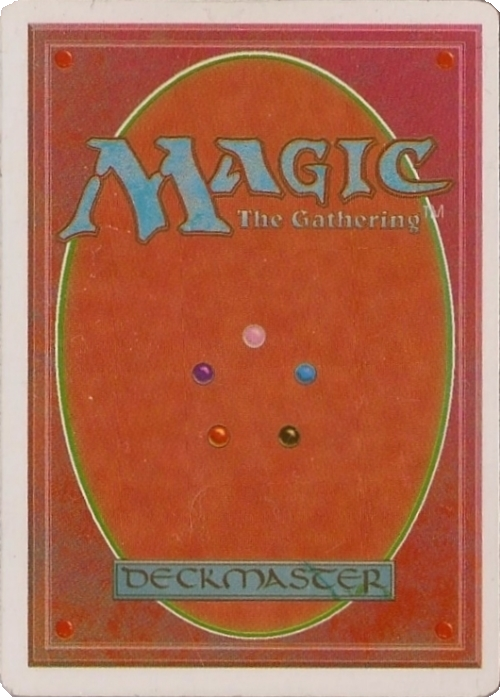 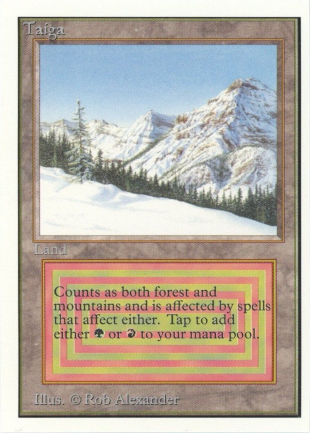 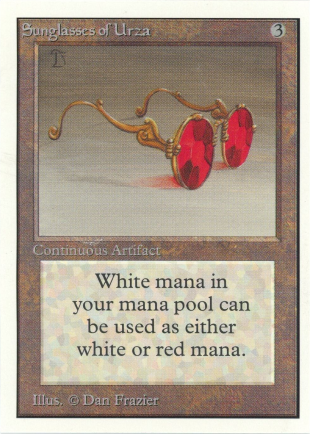 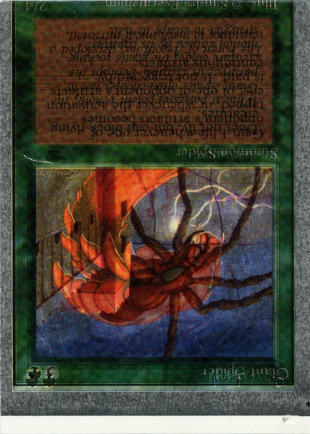 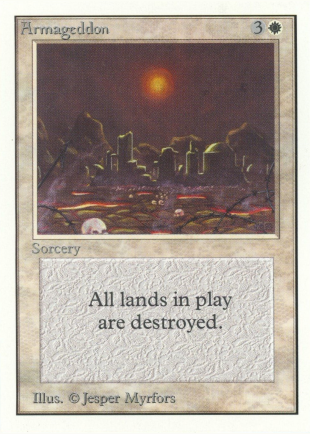 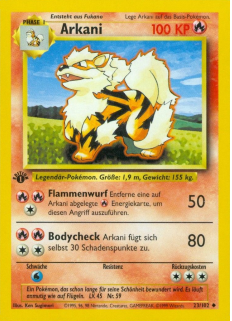 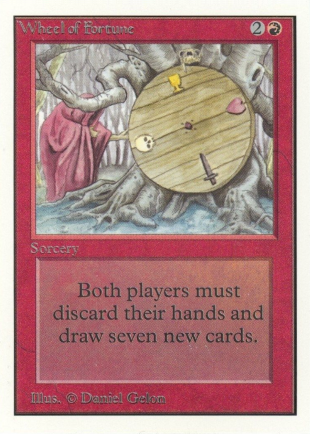 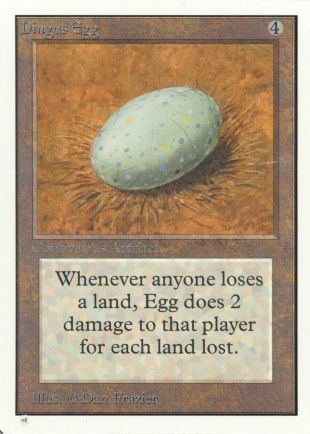 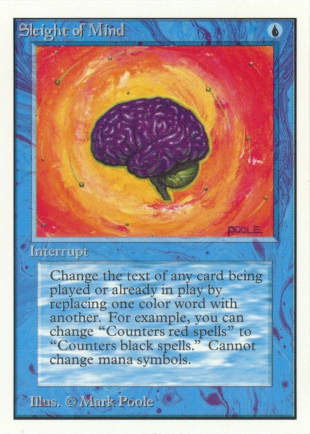 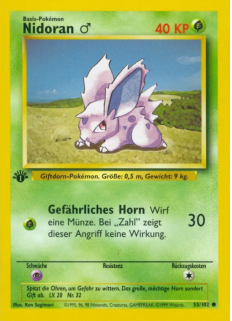 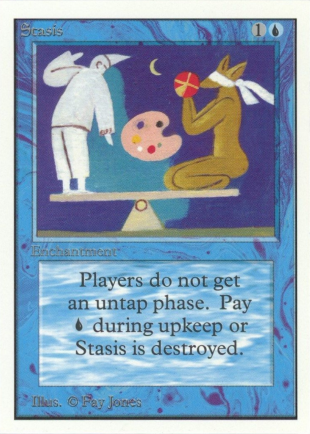 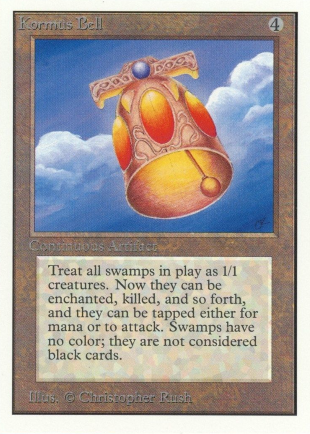 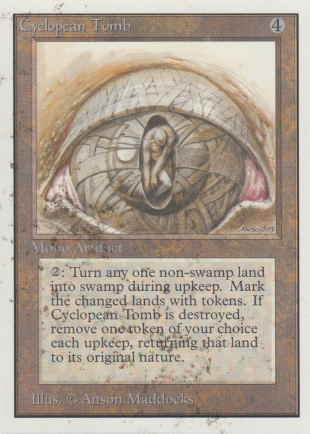 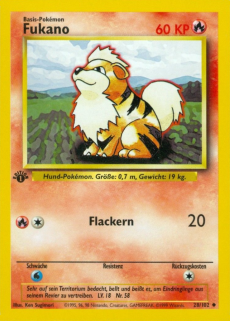 You can see on this card back that those colors have been swapped because the white mana ball is pinkish, being comprised of Red dots with Yellow dots highlighting the upper right. 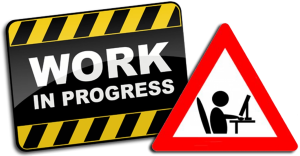 Further info not available for the moment. 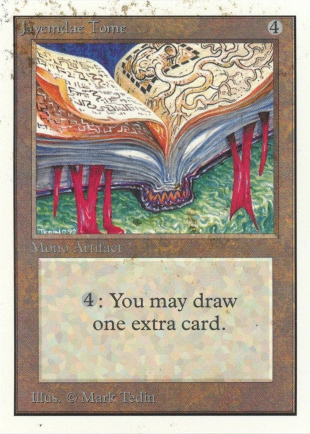 No additional info is available from the moment. 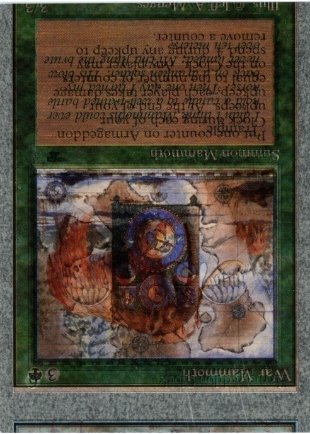 In 1994, Carta Mundi was manufacturing several different card games. 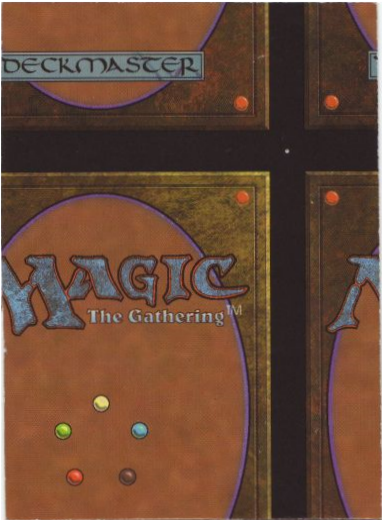 Two of these games were Wyvern and Magic: the Gathering. 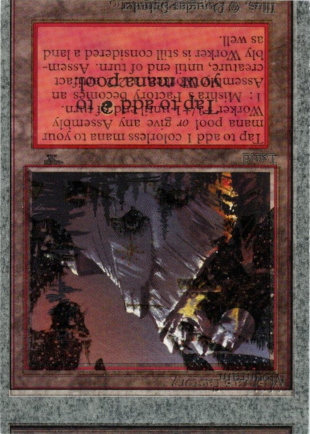 Due to a printing error, an unknown amount of cards from Fallen Empires were printed with Wyvern backs along with Magic’s card front. 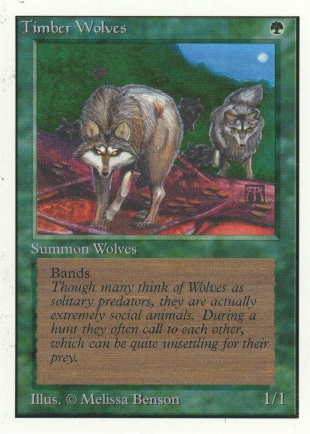 These were distributed in Wyvern Limited Premiere Edition starter decks. 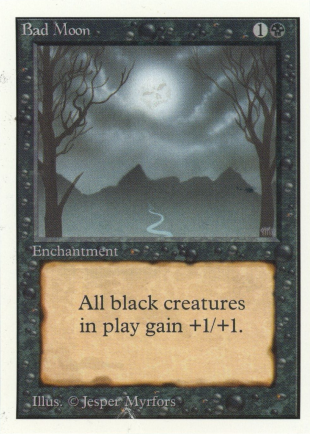 121 different cards exist (Common Set), no Uncommon. 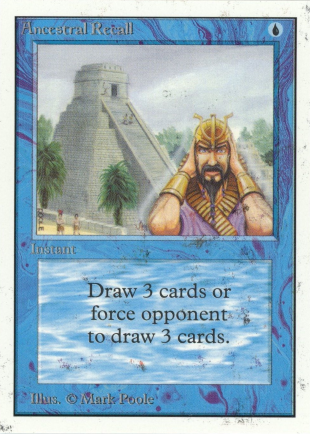 Each common card of C4 rarity has 4 different illustrations (each with a different flavor text), and each common card of C3 rarity has 3 different illustrations (also each with a different flavor text). 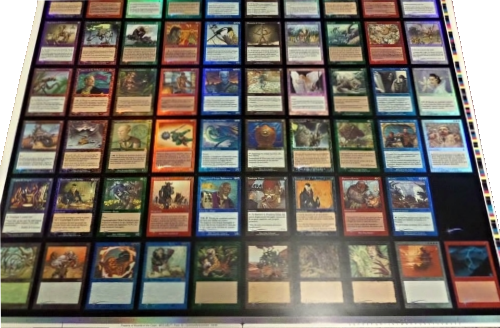 Some collectors own complete sets of the 121 Commons. 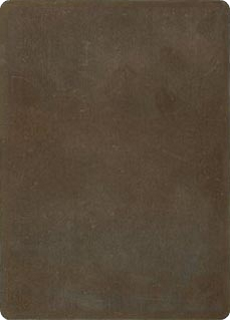 Two sheets (11 x 12) are known to exist coming from Traditional Chinese 5th Edition Uncommon sheets. 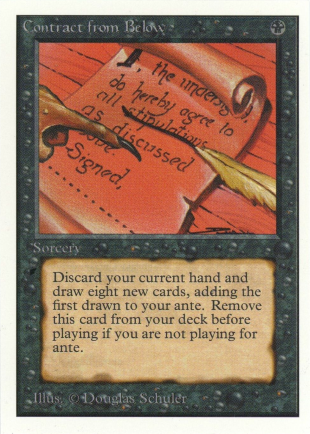 No additional info is available from the moment. 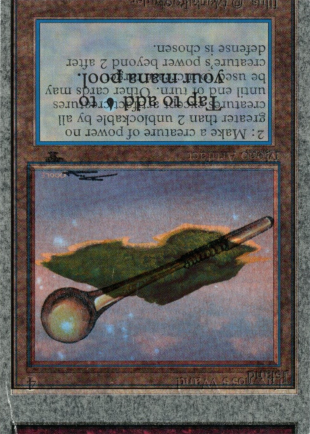 Here's the scoop as far as I know with them. 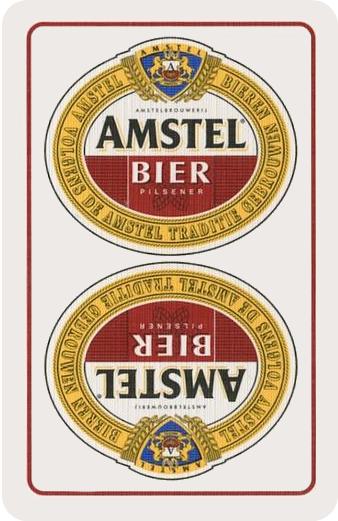 I worked at a packaging plant in IL called Production Packaging (It was bought out and is now Peacock Engineering - and of course they canned me and the other managers first.... that's another story). 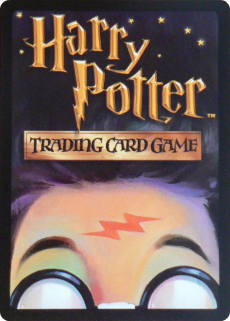 We packed out all kinds of items like gift sets, pop up displays, food items, and various games. 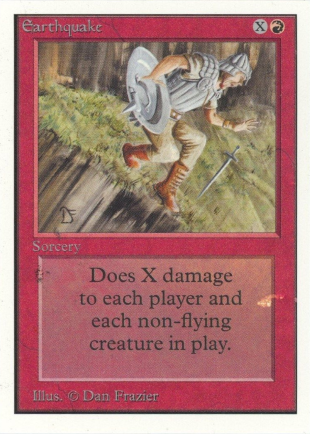 We did a job with WotC on a game called "What Were You Thinking". 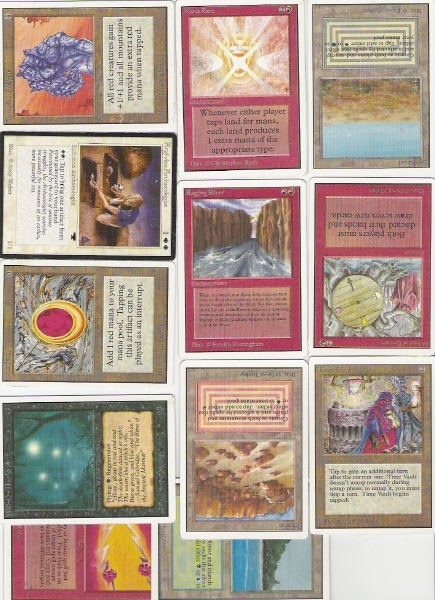 Our company ordered all the litho sheets and parts, etc..., and on some shipments coming in on those game cards, the cover of the pallets had all kinds of cool uncut sheets from many different card games and things. 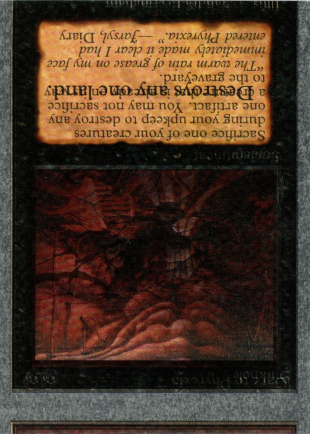 It's been like 3 years or so since I have been with them, but the main graphic companies we've dealt with were: Carta Mundi, Graphic Converting both out of our area in IL.. 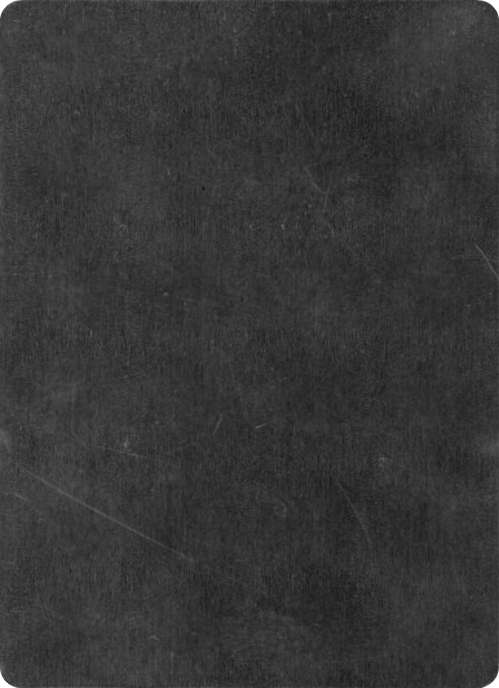 I can only assume that they are printed different items on the back sides because they may have been sheets they ran through the presses or through some process to set up or something. 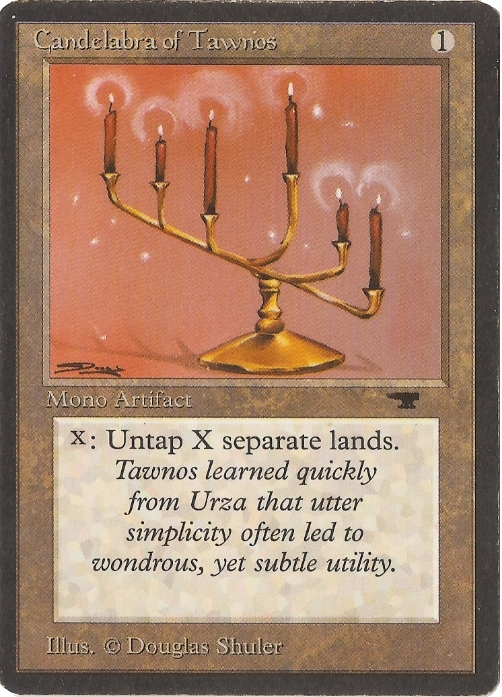 I think that it can safely be assumed that this is a wizard's product that was never meant for release. 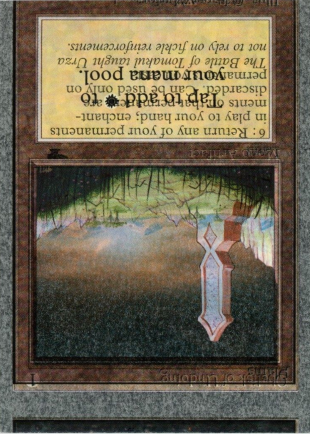 My thought is that it might have been the result of wizards testing a printer and rejecting the results. 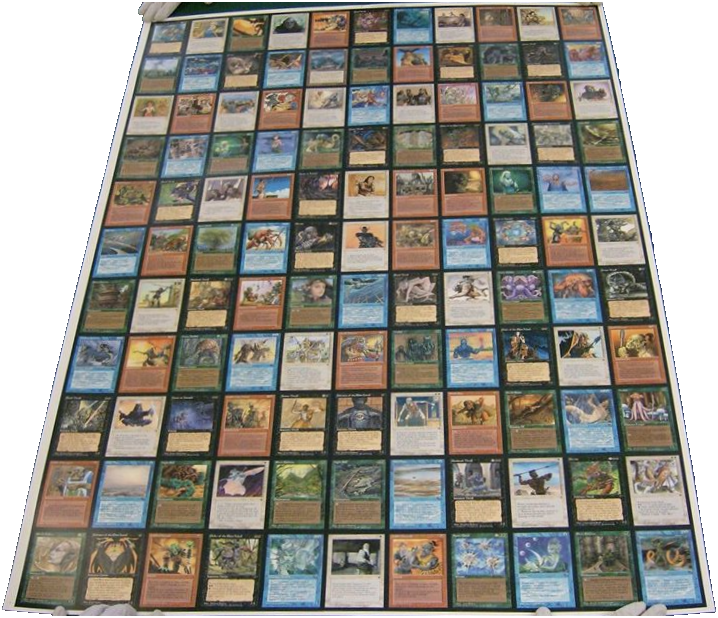 The sheets were scrap and ended up on an outgoing pallet and were expected to be discarded but were salvaged instead. 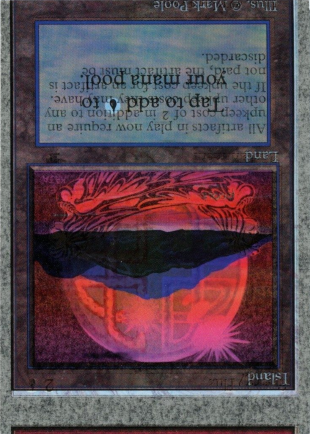 The sheet has color bars along one edge and says proporty of w.o.t.c.. My other uncut sheets all say this is the property of wizards of the coast or this is property of wizards of the coast. 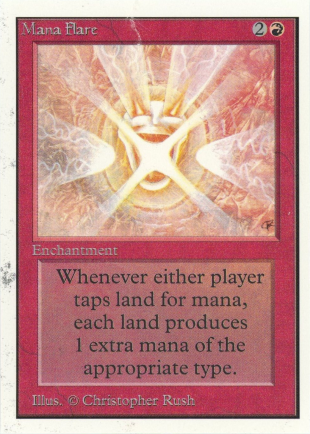 My main question about this sheet is whether it represents the correct layout of a 5th edition uncommon sheet? 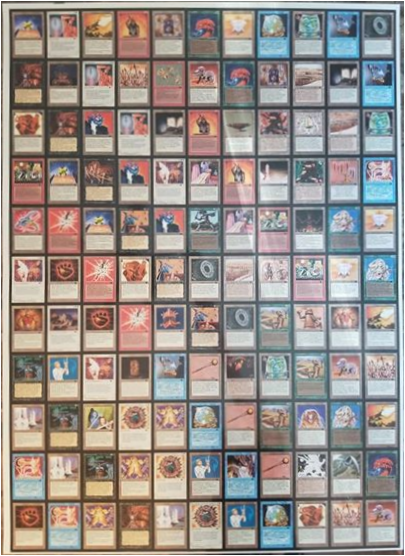 If anyone has access to a real sheet I would appreciate information. 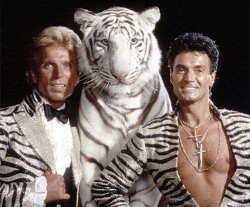 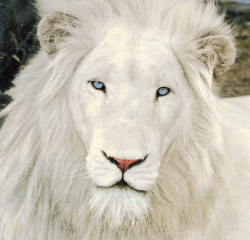 While I still don't know where they come from or for which purpose, they were used, the names are from the ones owned by Siegfried & Roy. 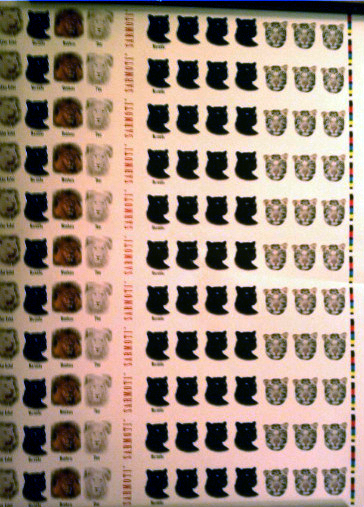 Fifth Edition Traditional Chinese Uncommon uncut sheet (11 X 12) with Tigers & Black Panthers & Lions back Sheets Front and Back. 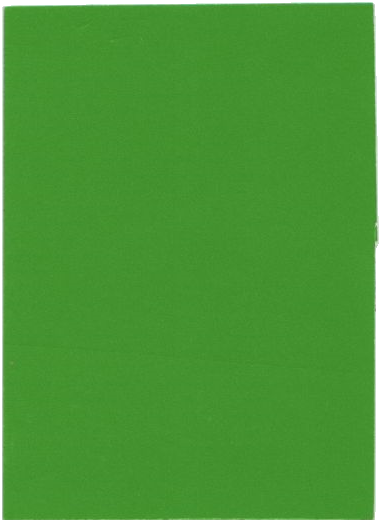 A green scrap sheet at the Carta Mundi printing facility in Belgium was used to check the sharpness of the cutting blade. 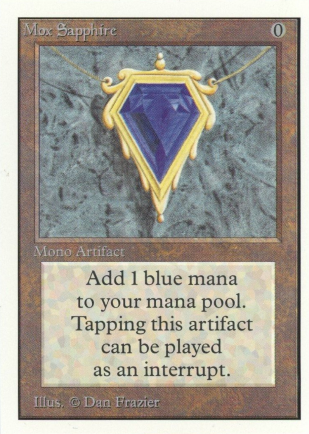 Some of the pieces have been surfacing since circa 1998-2000. 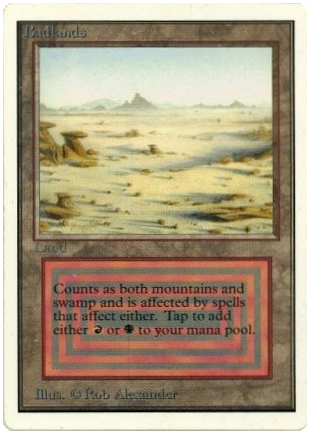 They are badly cut with square corners and not the size of MTG cards. 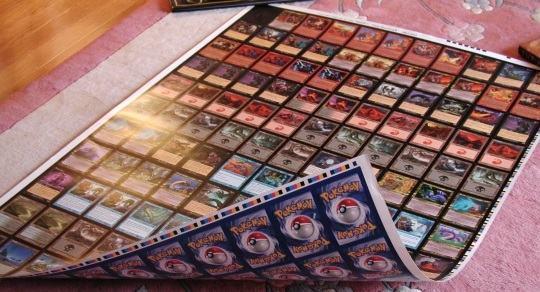 Uncut sheet (11 x 11) of Pokemon backed Magic cards printed by PBM Graphics, Inc. : Durham, North Carolina, U.S.A . 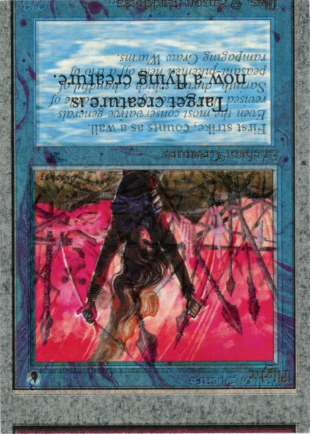 The sheet front has two 60-card preconstructed Invasion decks and a black filler card. 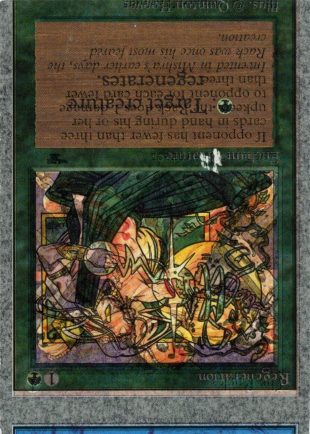 The Invasion theme decks are described as "A & B" on the Pokemon-backed uncut sheet, and correspond with the "Blowout" and "Dismissal" decks. 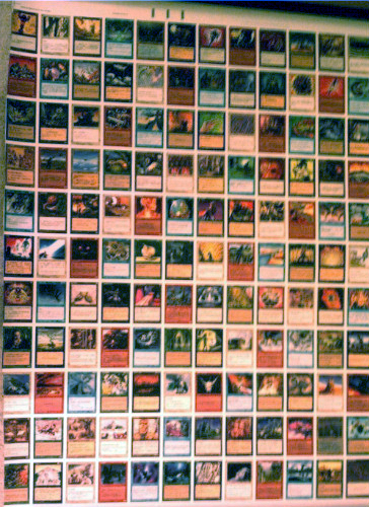 Uncut sheet of Invasion preconstructed decks with Pokemon backed Magic cards. 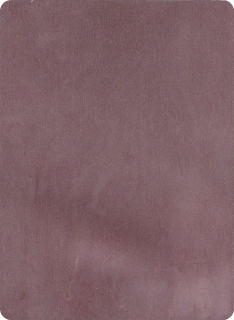 Top edge of the sheet. 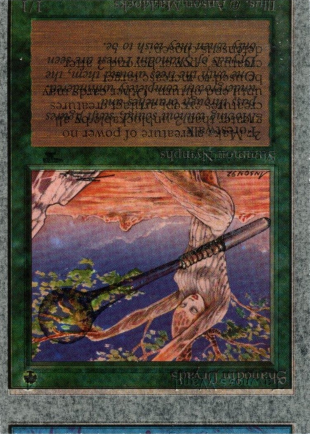 Furthermore, there is a high quality copy of a Fork made entirely of brass, a Birds of Paradise, a Shivan Dragon and an Hurloon Minotaur. 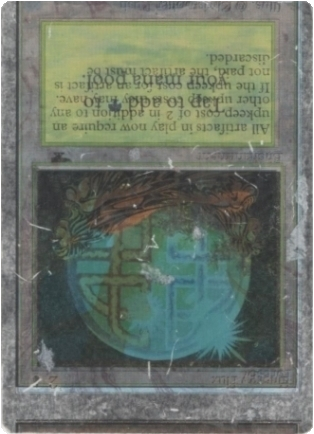 Those cards are believed to be unofficial, and maybe unique, third-party items created as samples to offer Wizards of the Coast alternate card creation techniques in hope of engaging in business. 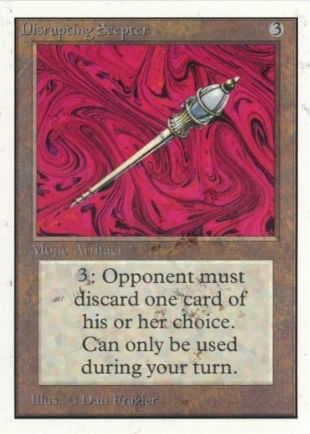 A better view of the brass Fork can be gained in a video created by of Marc Gembinski (MPG format) Metal Fork video. 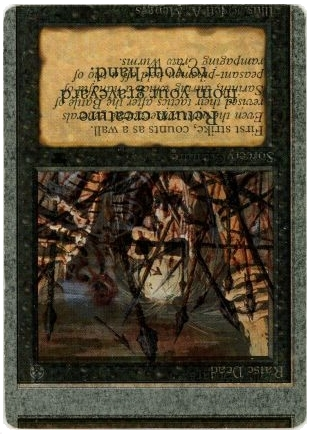 It has been confirmed that this is not a WotC-created product. It also was not handed out at a convention. 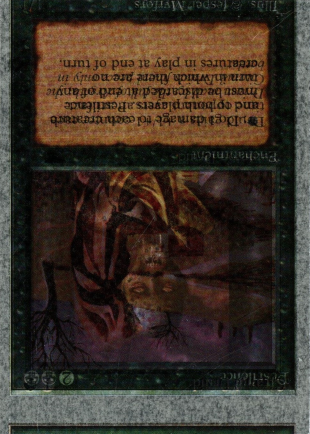 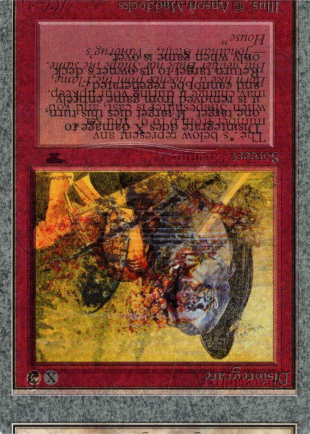 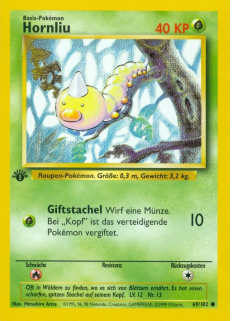 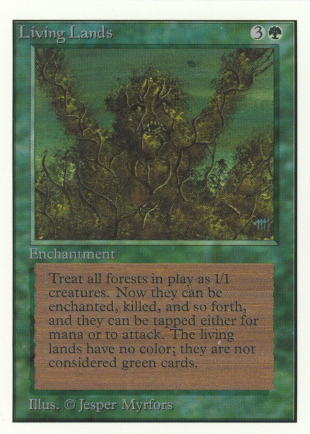 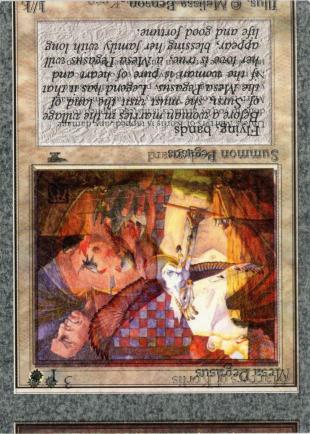 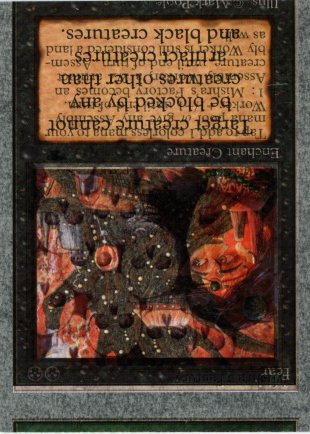 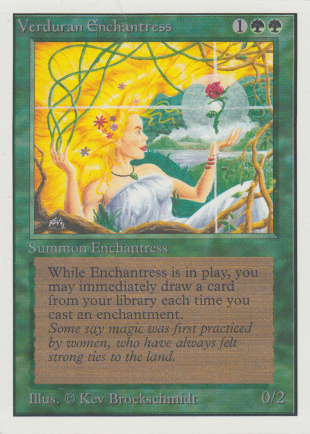 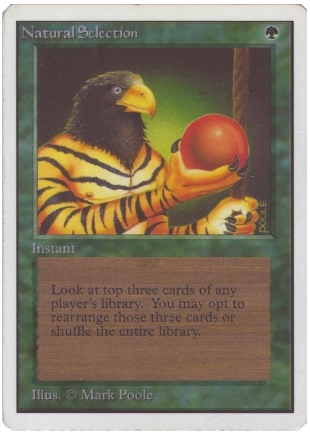 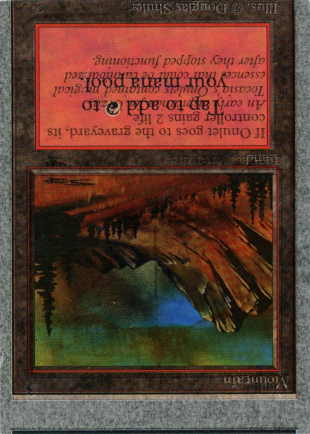 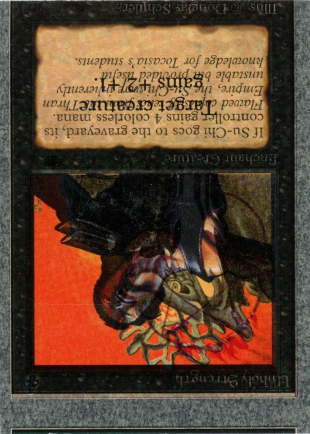 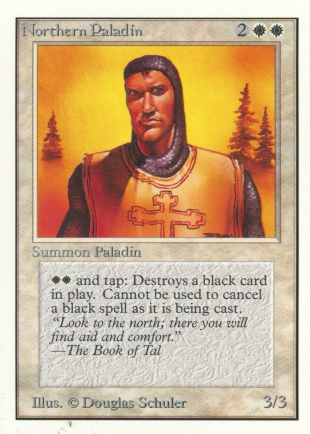 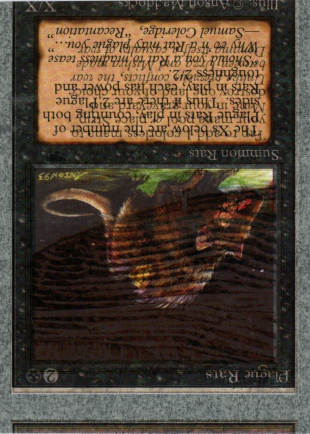 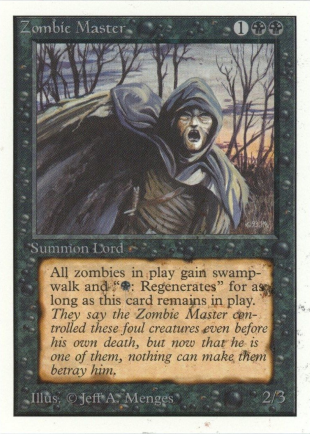 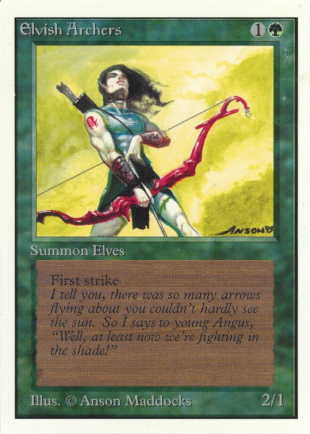 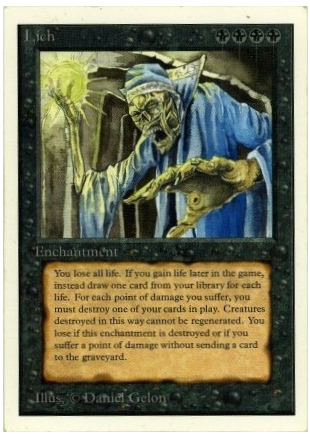 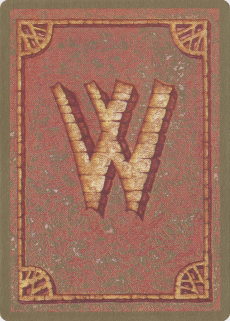 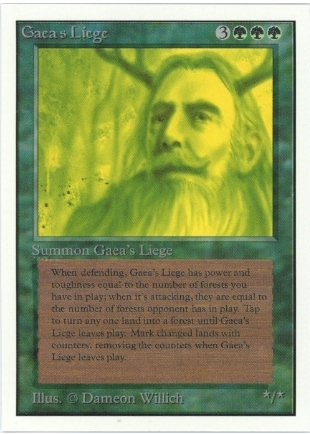 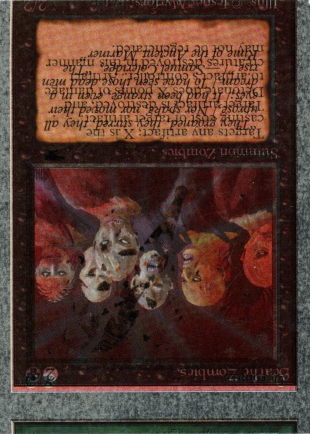 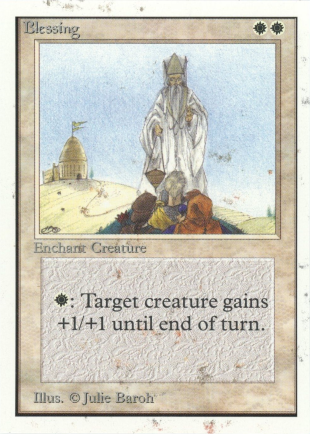 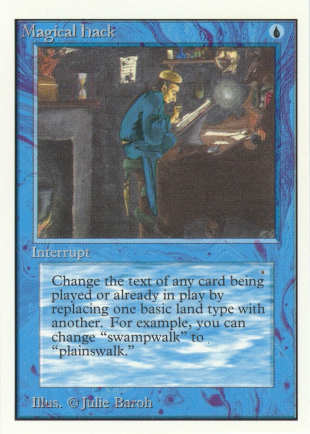 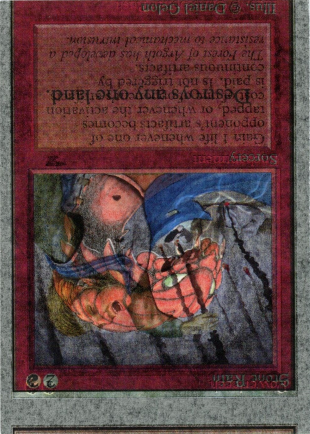 The image on the card is from the Revised edition, so that would place its creation sometime in 1994. 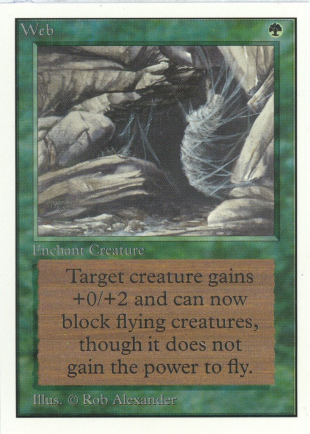 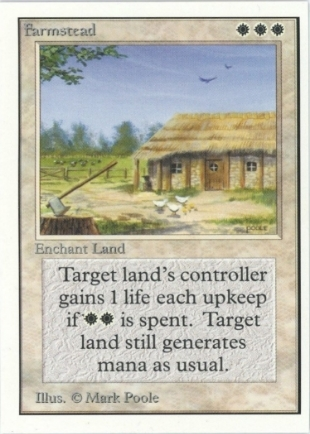 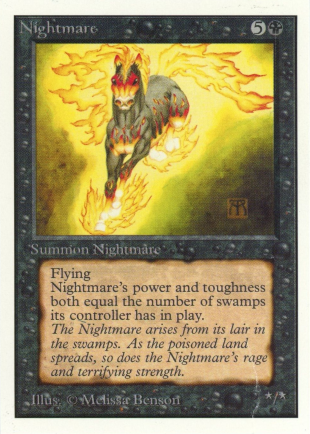 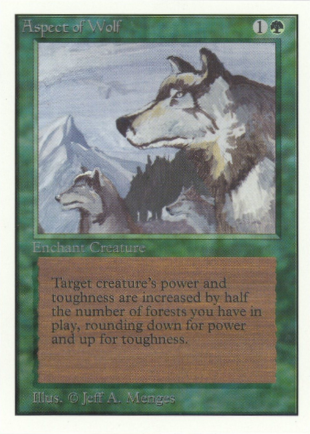 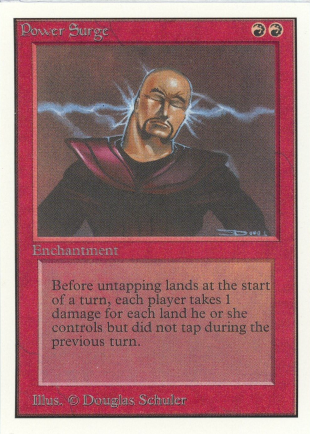 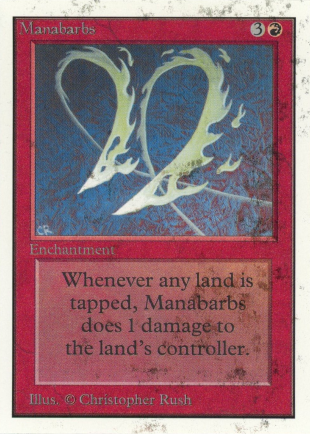 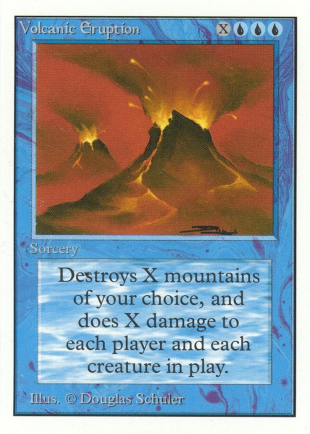 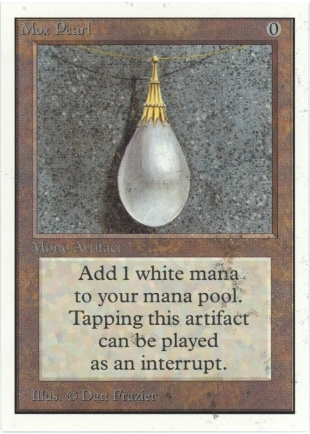 The best estimate is that this is a sample card: created by a company as a sample, hoping to sell its process to WotC. 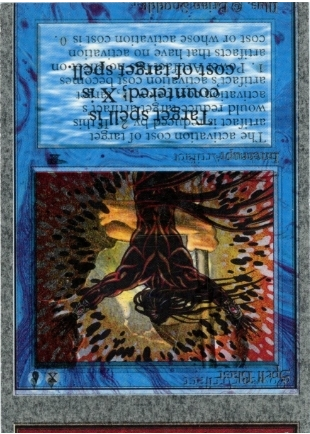 The sample was not accepted, and the usual course of action in such a situation is to destroy the samples. At least in this one case, that was not done, and now the metal Fork resides in a private collection. 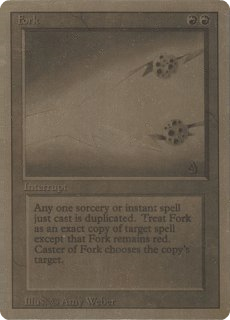 The metal Fork appears to be made of brass. 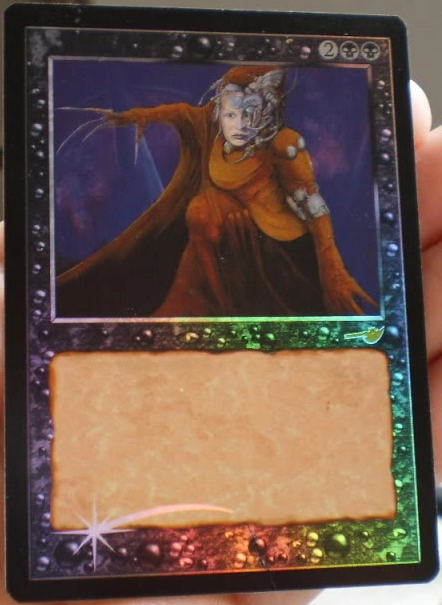 It's very shiny, and the scan does not do it justice. 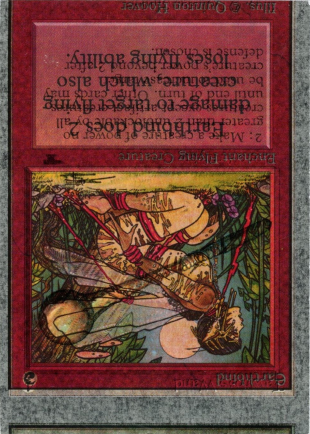 The picture and text appear to be imprinted with some sort of laser etching. 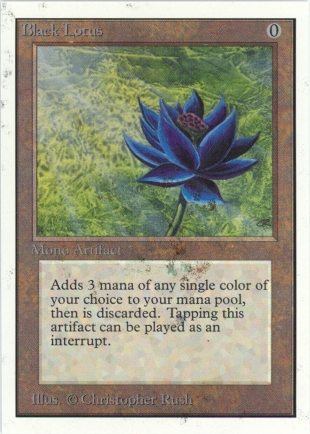 Supposedly there is a black lotus, but I have never seen it or gotten confirmation it exists....there may be other cards, but again never seen or heard of another. 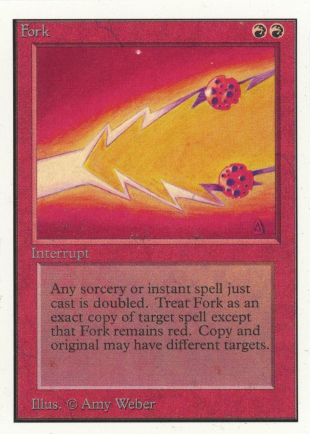 Stausch had the fork and told me some company made four of them trying to pitch the idea to WotC. 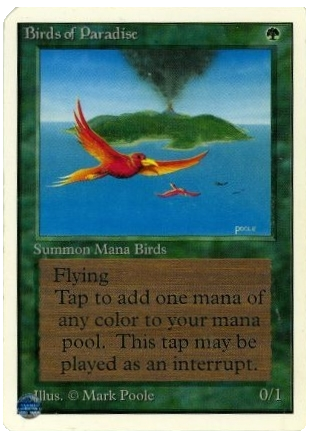 But when it got shot down they had to stop for copyright issues. 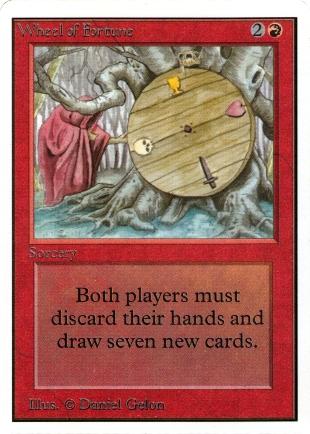 I can promise you there is more than 1 of fork and shivan. 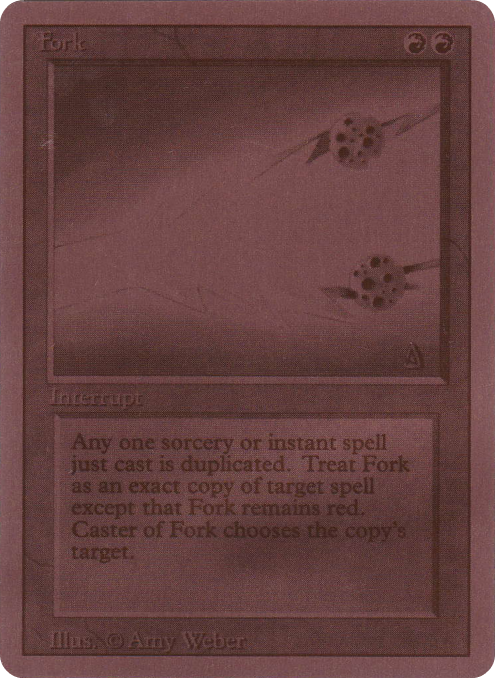 A guy at Worlds 97 had two forks he was attempting to sell, his price was pretty crazy, so dunno if they sold. 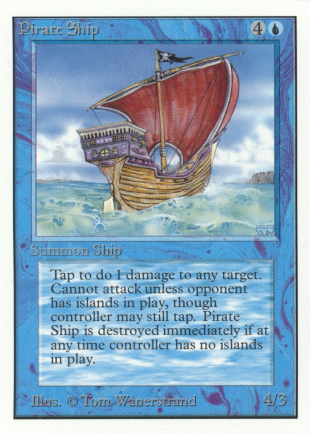 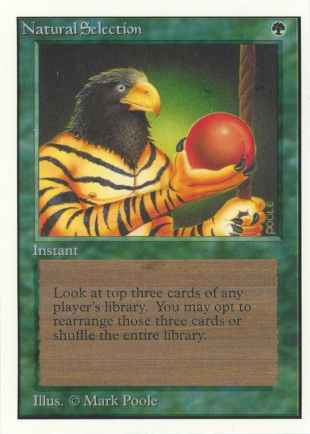 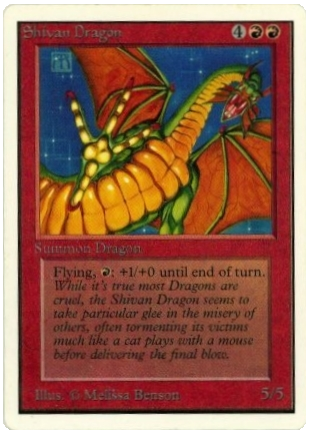 At Worlds 98, two Shivans showed up and sold during the week......I saw another one later that year that a WOTC employee had at the game center. 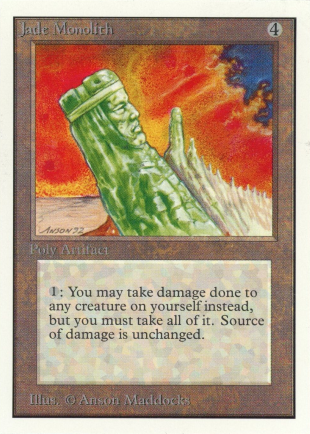 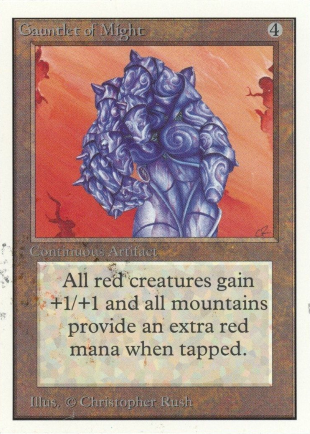 I think too, if you look in the pictures of the one WOTC employee's mega magic collection, he has a metal card in it, which I believe is a shivan. 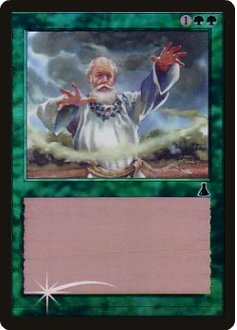 From what I was told, there was less than 10 of the Fork made, less than 20 of the Shivan.....never been given numbers on the Birds. 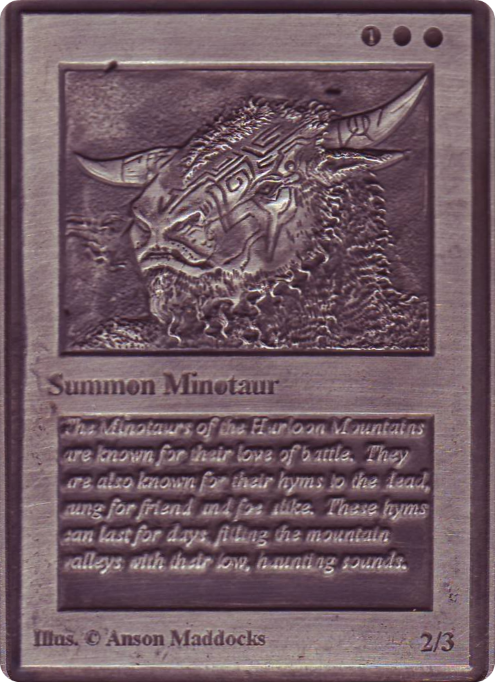 Len told me he has seen just 3 (counting mine) of the Hurloon Minotaur. 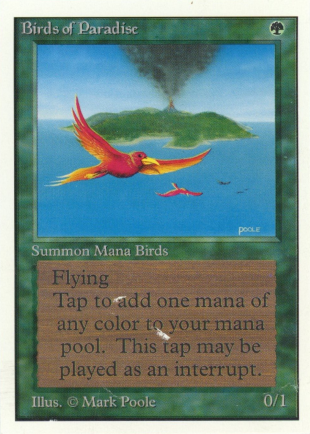 Metal Birds of Paradise Revised 1994 front. 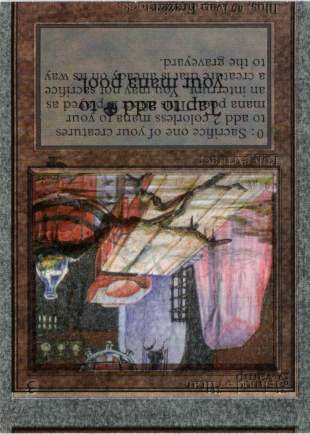 This one is of much poorer quality, looking like etched aluminum or tin. 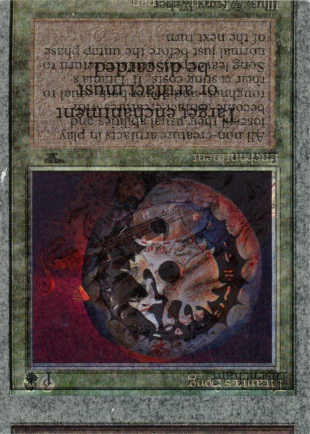 This is a homemade metal card others were created. 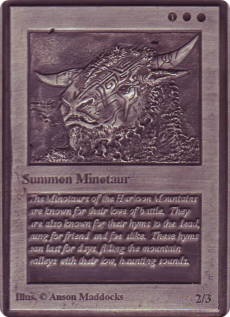 Regarding the Hurloon Minotaur, nobody is quite sure how many of these exist (apparently 3). 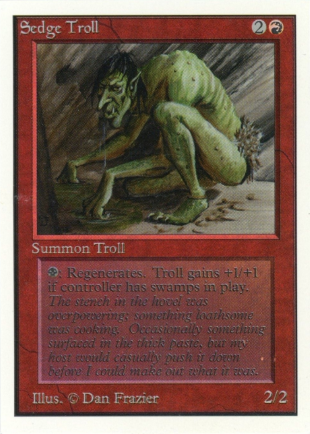 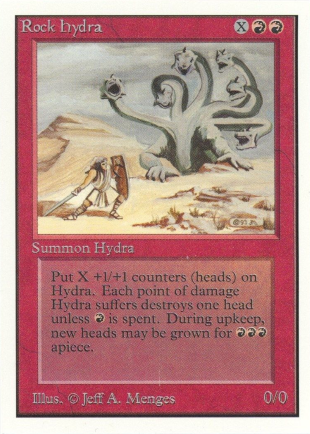 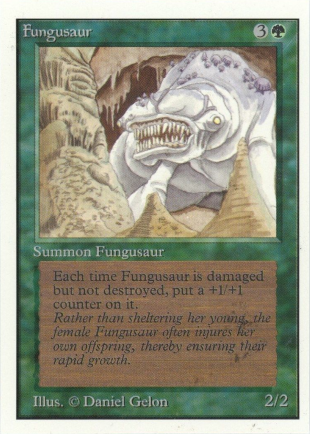 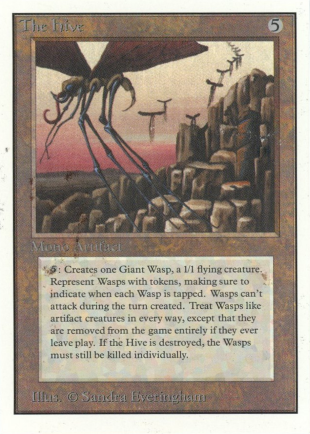 It came from the collection of an ex-WotC employee. The card is unlike the other metal cards (Fork, Shivan Dragon, Birds of Paradise). 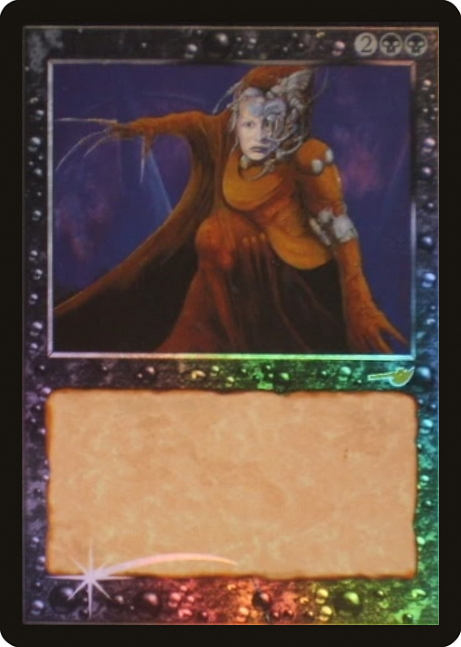 Unlike those cards which were pristine castings, this one is a much rougher cast. 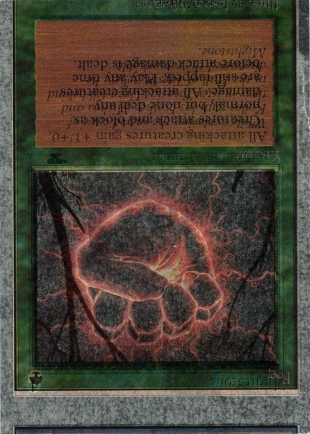 The cards imperfections are from casting, they are not damage from handling. 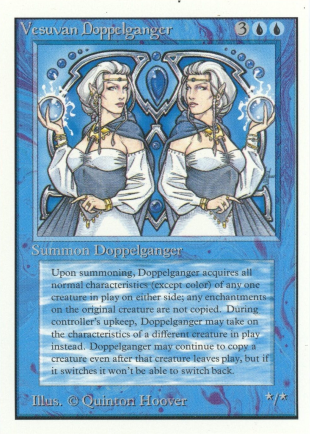 It looks like these cards were cut by hand with a pair of scissors. 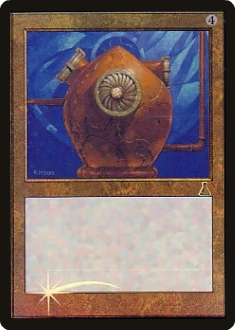 They are almost certainly from one of the start-up scrap sheets. 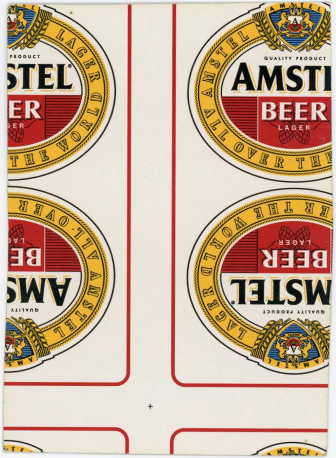 The Amstel beer logo on the back says: Amstel Lager "All over the world" and was probably intended to be for Amstel Beer playing cards. 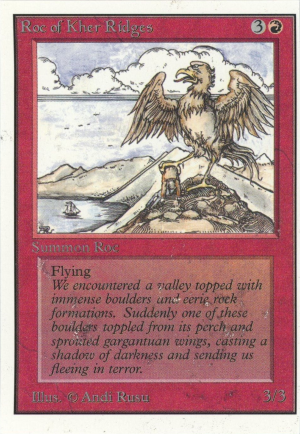 They are supposed to come from Carta Mundi. 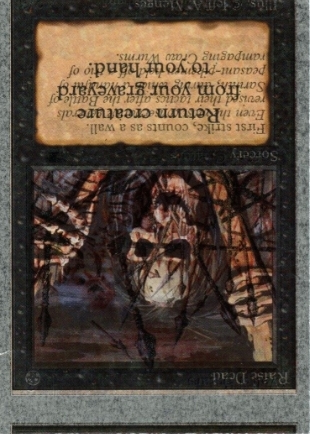 Read the Specimen Stronghold cards subsection (in the Test Prints subsection) and internal links below for more info. 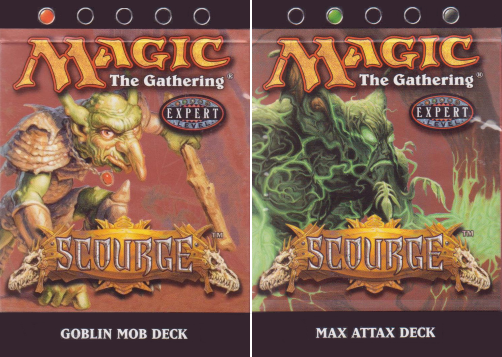 From the Preconstructed Decks "Goblin Mob" and "Max Attack", 60 cards. 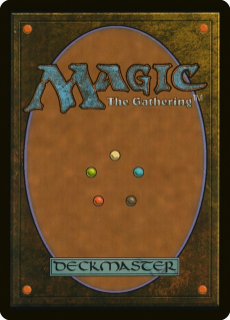 As today 3 decks are known. 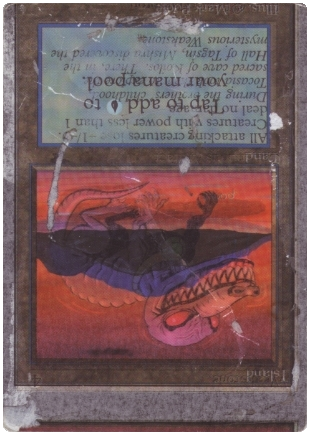 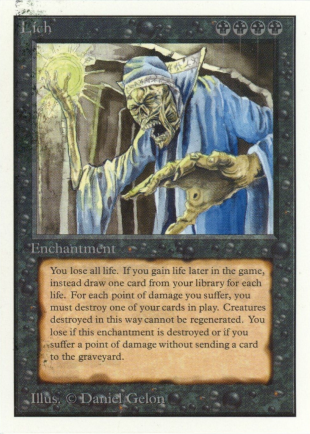 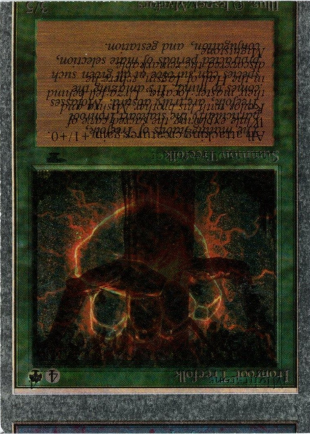 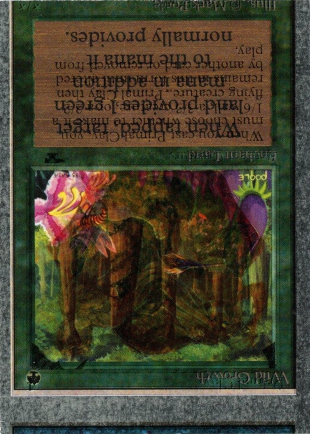 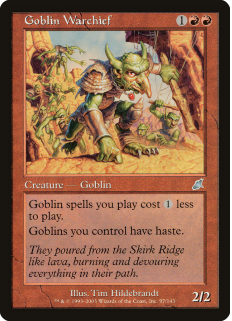 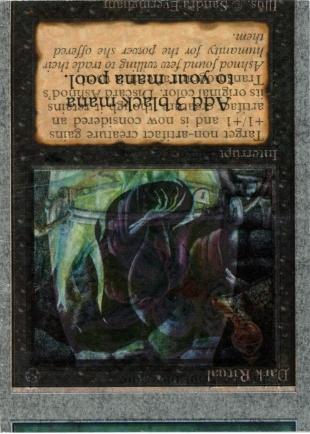 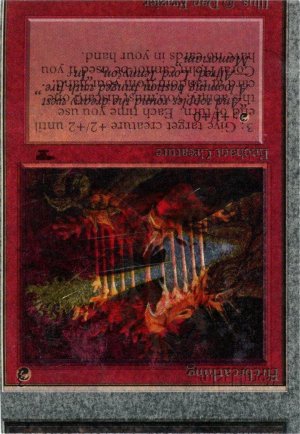 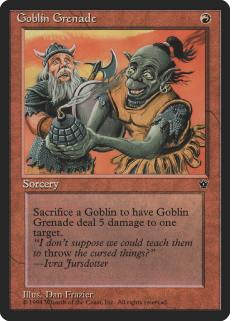 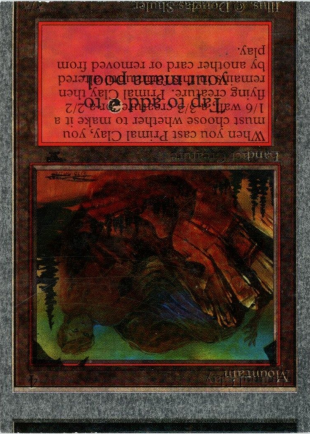 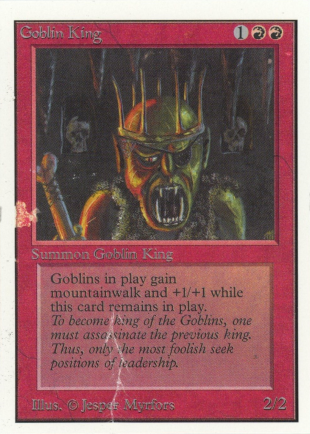 The "Goblin Mob" deck was sold 13,100$ to a private collector on Ebay in 2003, after an epic try from Magic Rarities Members to get it, a second "Goblin Mob" deck was sold to a private collector also on Ebay in 2012 for 4500$. 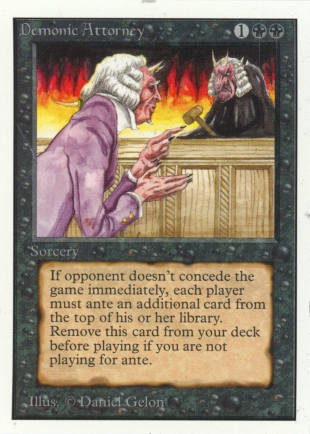 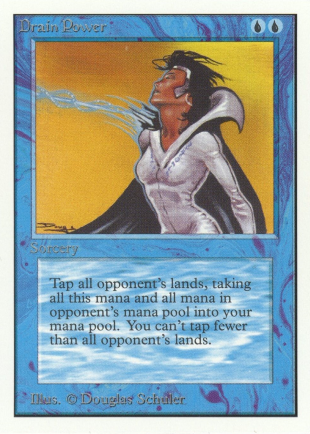 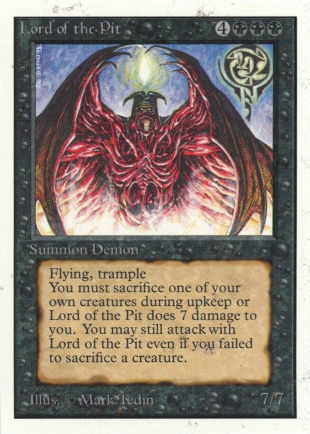 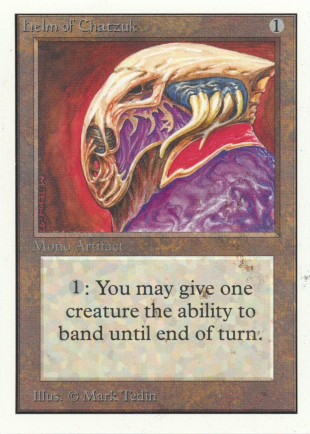 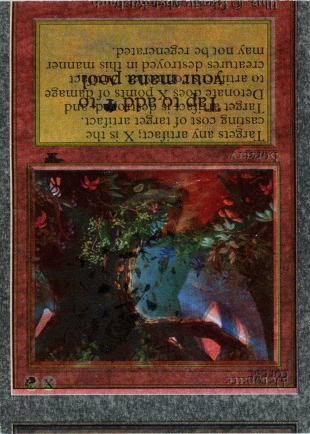 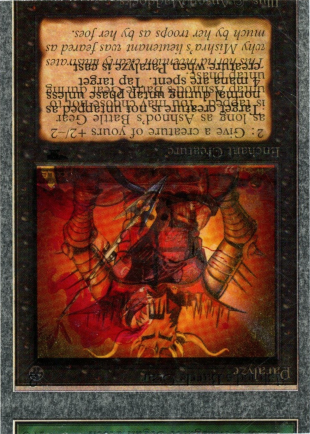 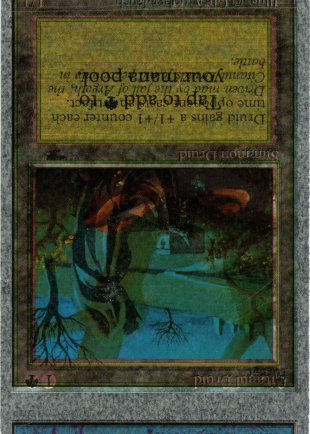 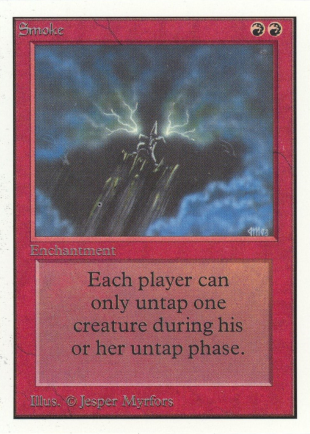 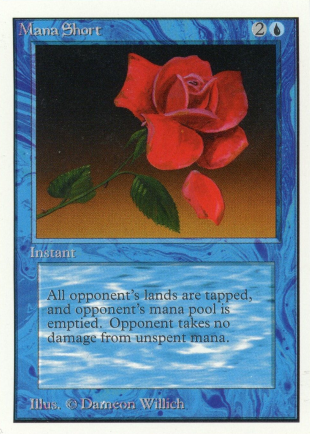 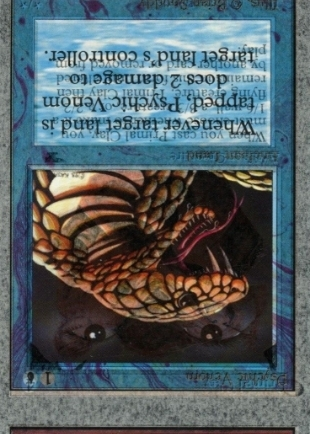 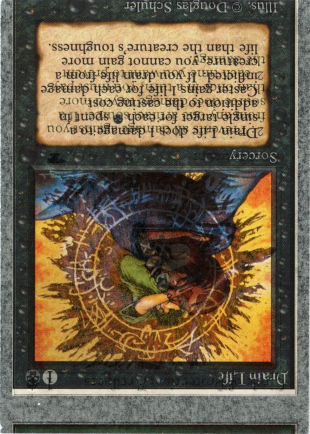 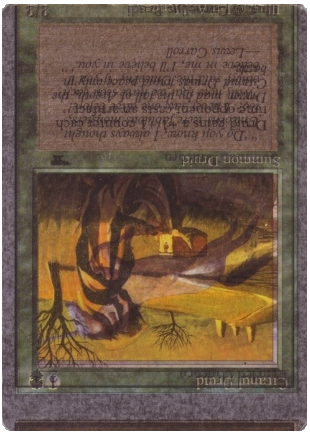 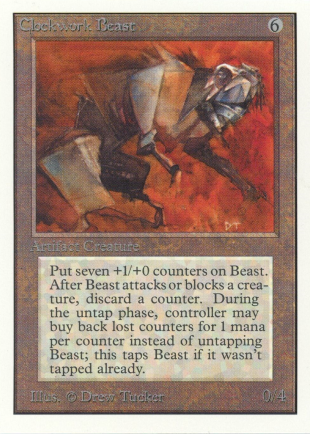 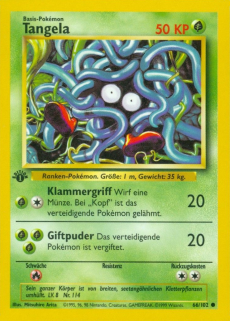 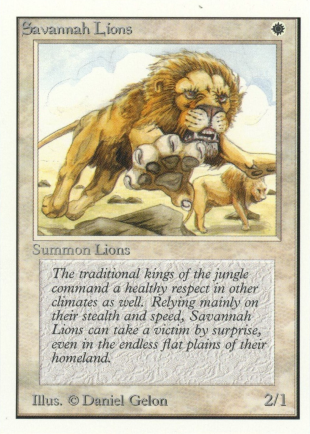 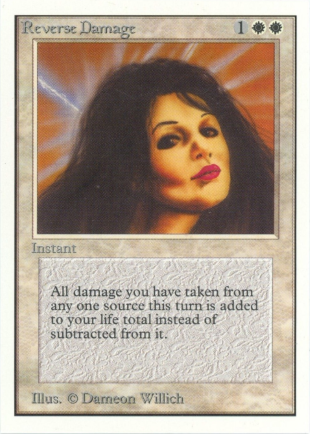 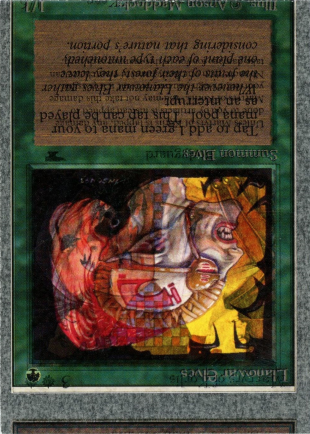 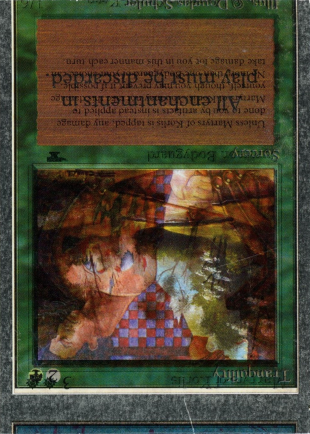 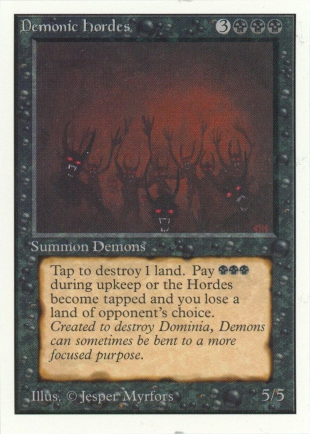 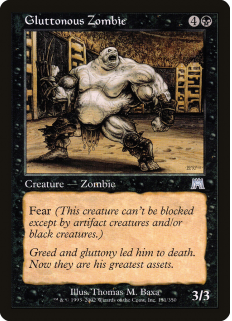 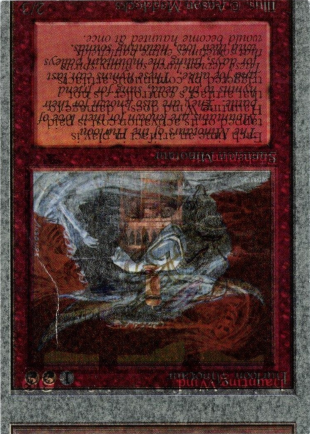 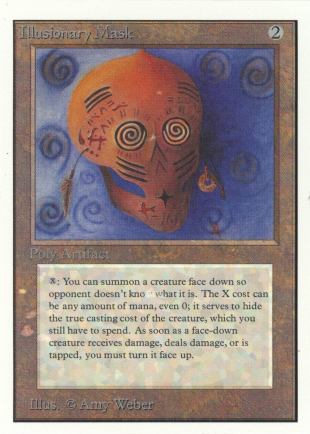 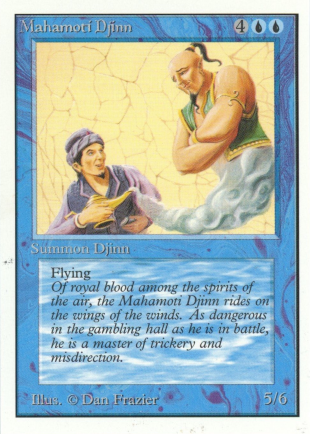 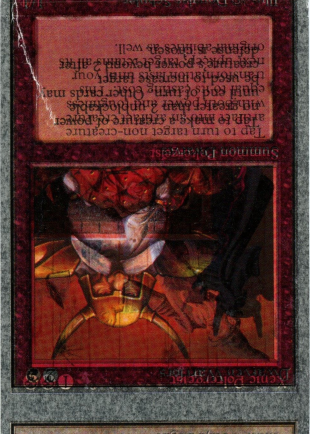 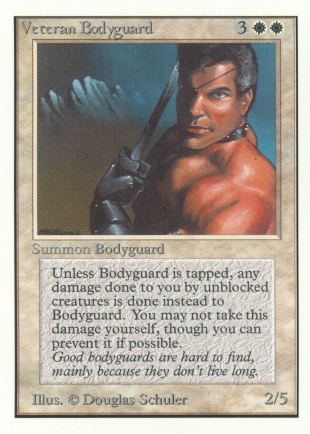 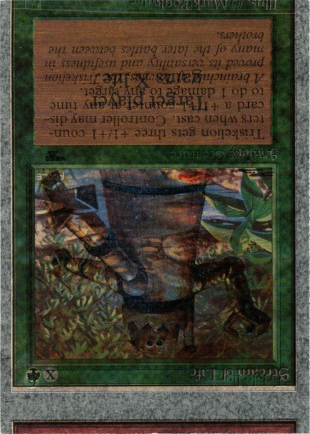 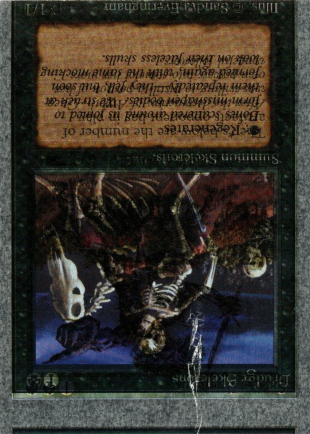 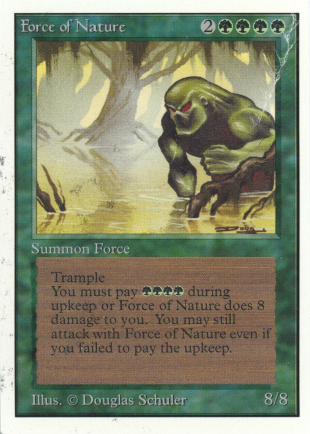 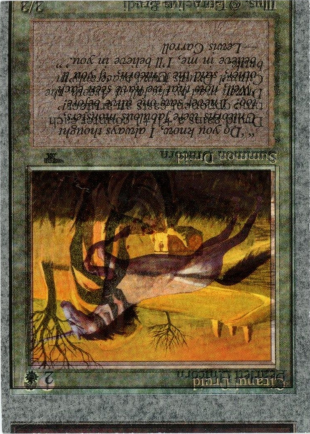 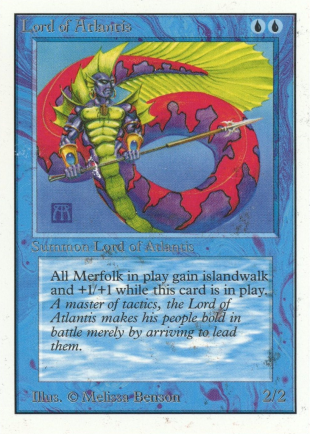 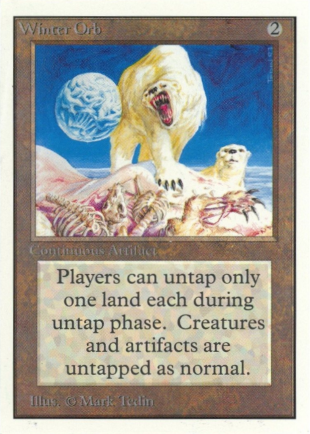 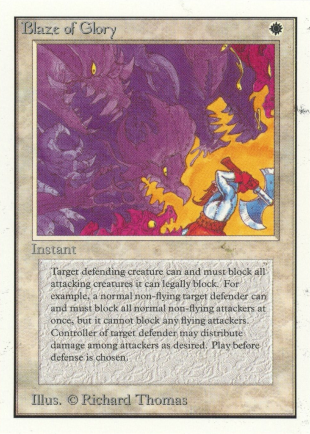 The "Max Attack" deck was sold to a private collector in 2004, as there's 2 Preconstructed Decks per sheet, a second "Max Attack" deck is supposed to exit. 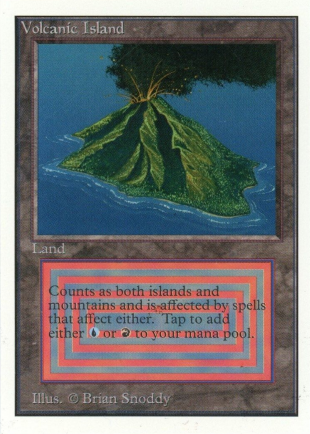 The trimmed round corners cards (as well as only one 4 square corner card) comes from a Rare setup sheet of 117 Rares and 4 Islands. 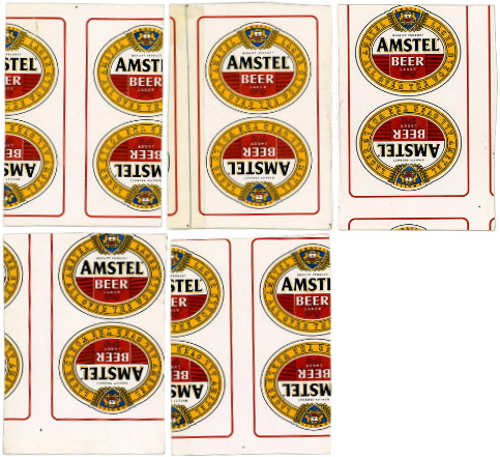 Some cards out of that first sheet were given an attempt to get rounds corners for the personal use of the CartaMundi employee who wanted to play with them, while the other sheet that was uncut at the basis was hand cut much later with square corners. 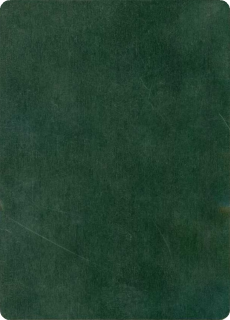 Set up sheet definition: They are used for the printing (error checking, color matching, etc.). 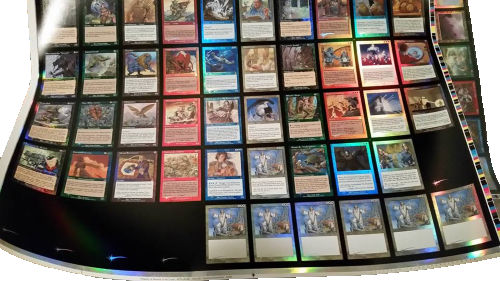 Printers never waste anything, so sample sheets from one setup were probably flipped over to help set up printing of another series. 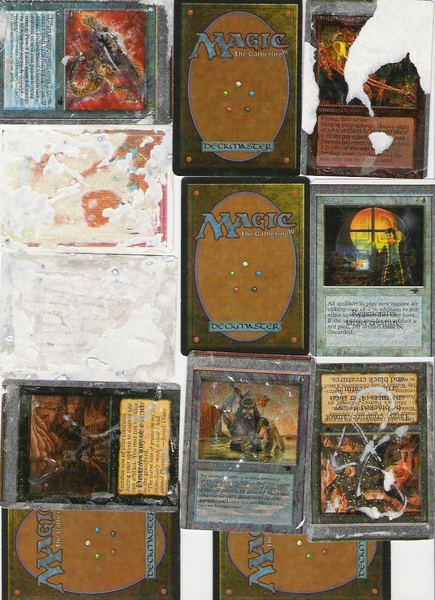 The only problem is that one of these sheets (probably later used as protection on the bottom of a stack of regular production sheets) actually got processed through the cutters, and got turned into cards. 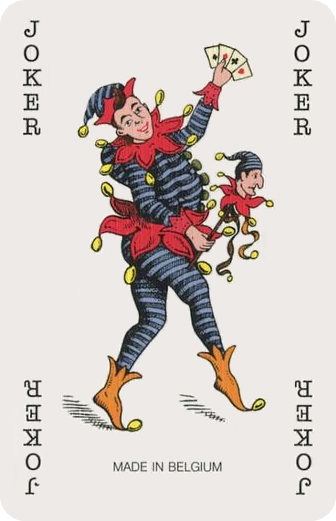 These cards have been pocketed by a worker to show off what was being produced (showing friends a sample). 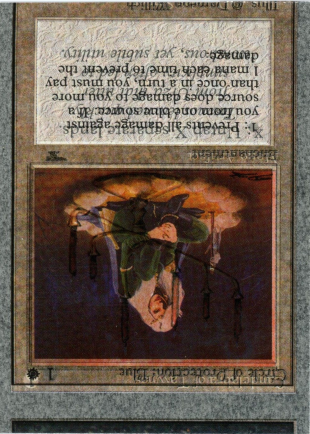 In either event, most of these types of cards would get thrown out, but in this case someone decided to hang on to them. 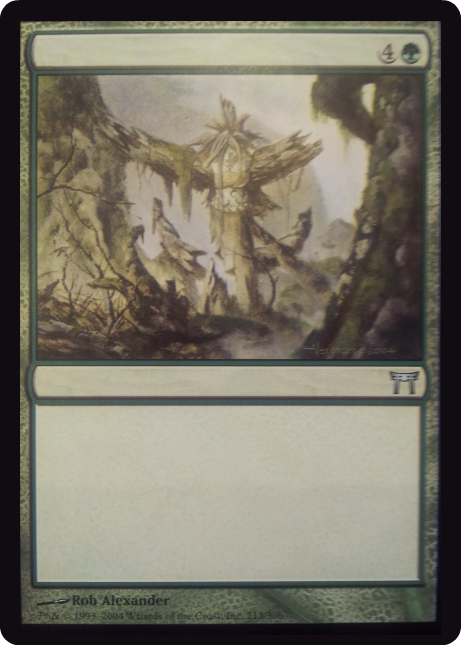 Why these cards are not Test Prints: These misprints were never meant to be made as cards or released to the public. 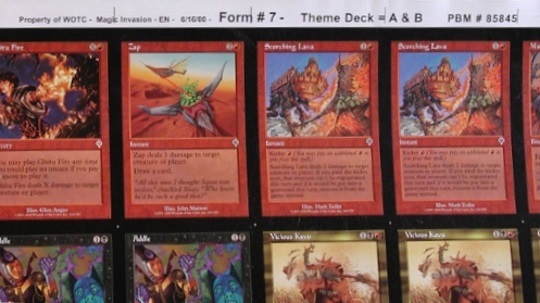 That these combinations even exist is likely due to a printer's desire to reuse and recycle discarded product wherever possible. 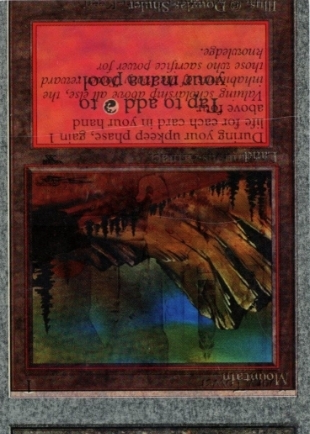 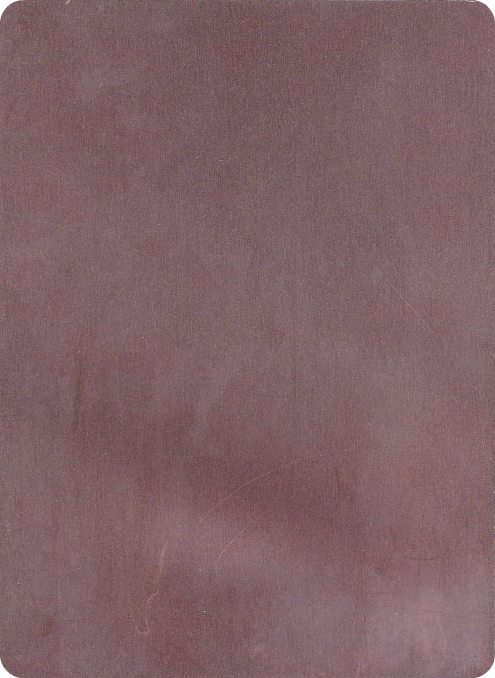 The printer was reusing the backside of some rejected cardstock as a press preparation on some later printing (perhaps a color or technical composition check, or perhaps checking the performance of a printing press. 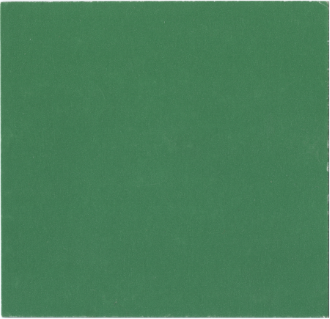 We'll never know without seeing the rest of the sheet). 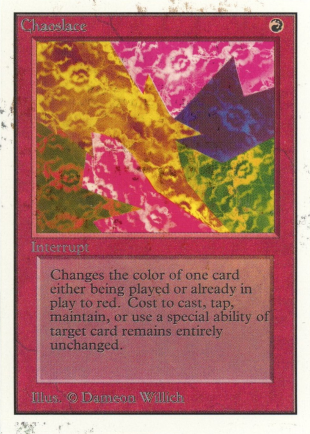 This sheet was obviously rejected more than once, and was expected to be destroyed. 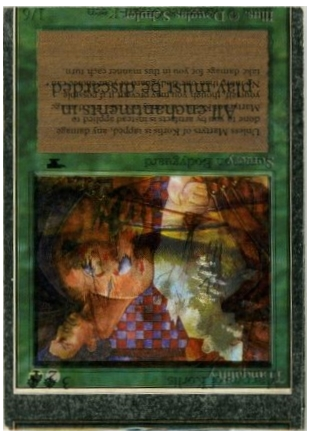 It might have been used as packaging, or maybe even thrown out. 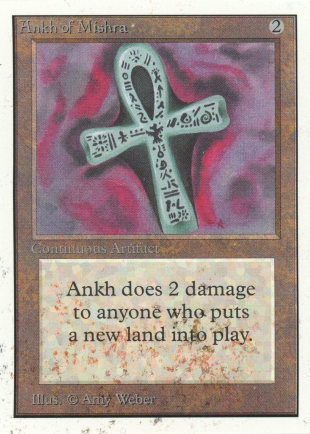 Yet somehow it survived and was cut into cards (maybe its last use was to set up the blades in the cutting stage for good magic sheets). 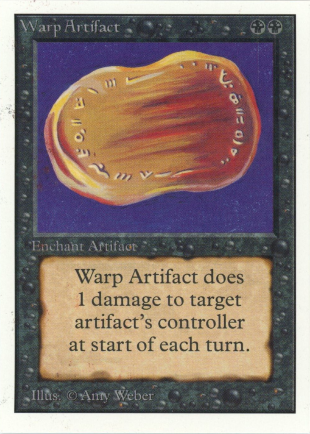 "The Unlimited test prints came from the vaults of Wizards R&D in the late 90's early 2000's. 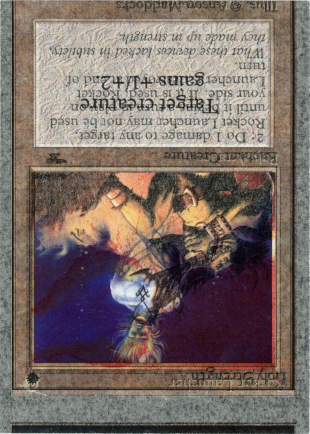 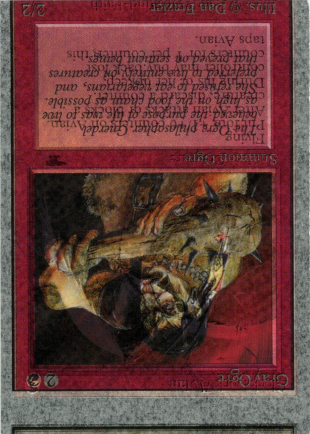 Wizards thought about printing revised with a silver border and had a test done. 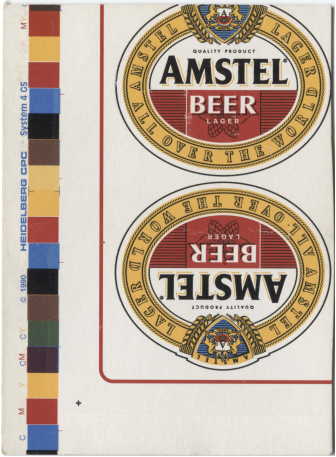 They used old or half printed sheets when testing printer/color settings. 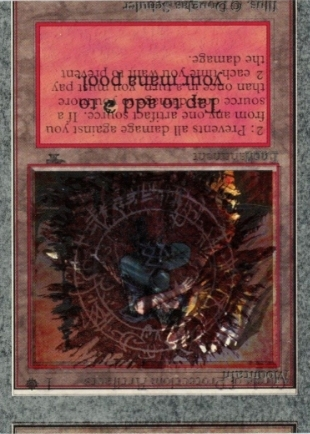 In this case, it is suspected that an existing Unlimited sheet which did not have the backside printed was used. 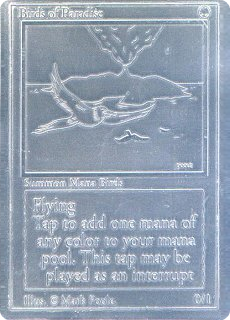 As the idea of silver border was scrapped, the printer then used the sheet to set up the Antiquities set printing. 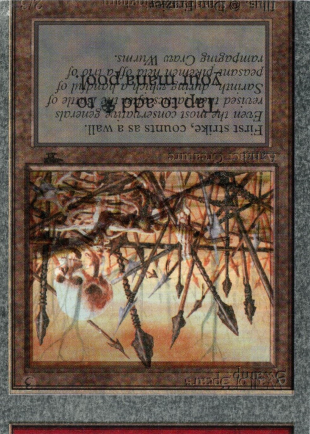 The sheet was cut at the factory at the time and square blades were used. 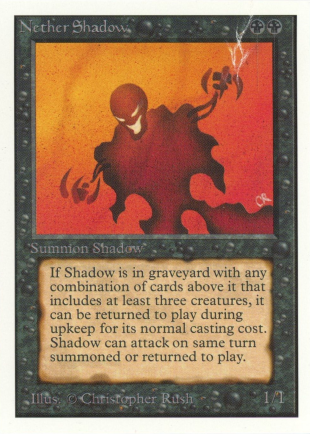 Why is unknown. 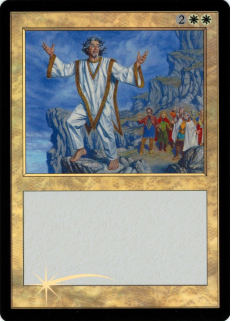 From kidicarus2000 (First statement): "A few years ago an old employee of Carta Mundi sold about a dozen cards that are identical to the ones from this sheet, with one exception. 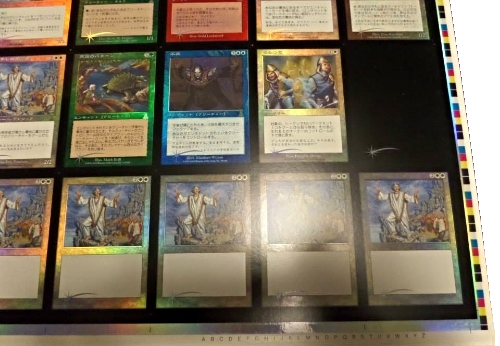 The employee had taken some scrap cards and used them as playtest cards for him and his friends and had actually glued them to the back of regular cards. 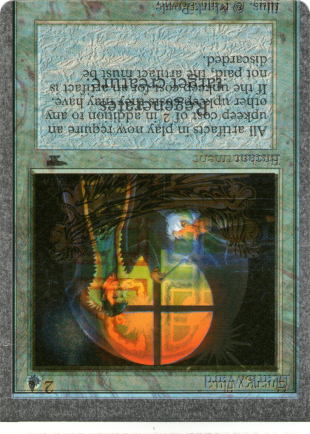 This is why some of these Unlimited exist that look very weird on the back. 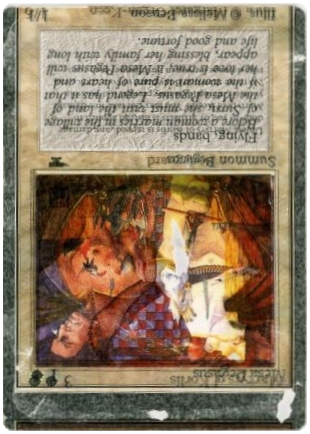 They were glued together, then carefully pulled apart as best as they could be. 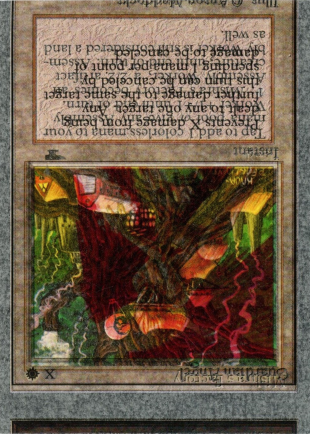 This means that, theoretically, a second copy of each of these cards could exist somewhere, though only a dozen or so of the other sheet have surfaced from that employee who glued them together." 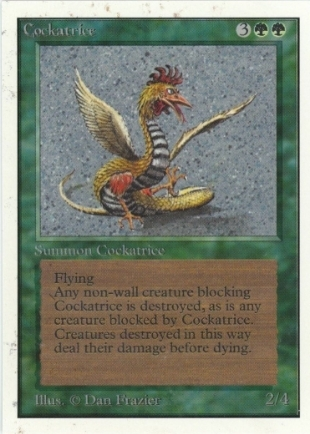 From kidicarus2000 (rectified statement): "This card came from a full sheet of these test prints. 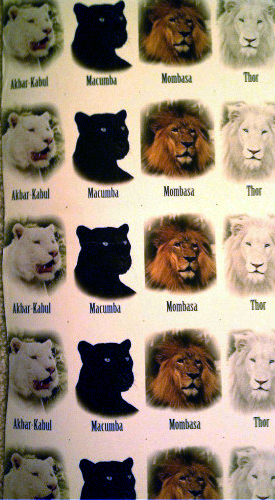 The sheet had one of each Unlimited rare printed on the front. 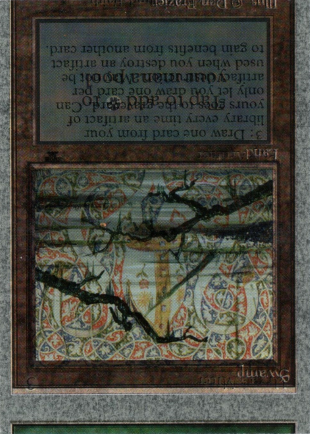 On the back, both a full Antiquities sheet and an Unlimited common sheet are printed on top of each other. 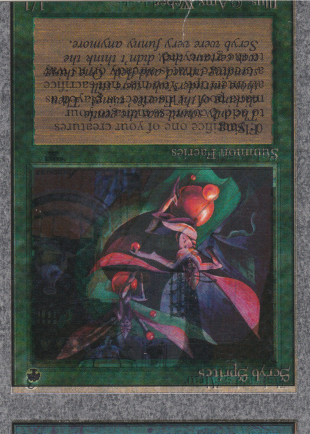 The sheet was rolled up at some point, which led to the cards being slightly warped. 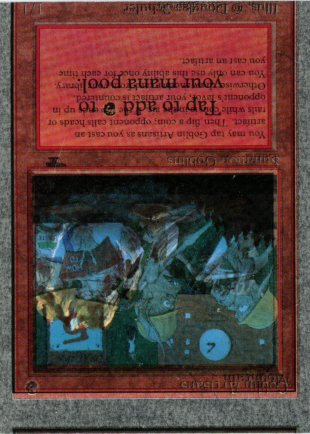 The sheet was hand-cut at some point, though it is unclear who cut it. 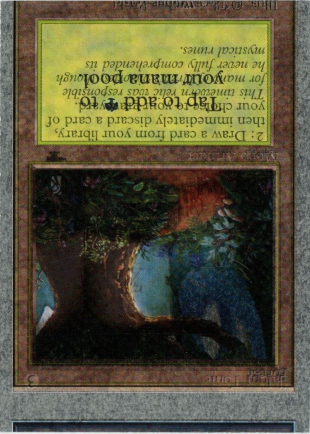 Because the sheet was hand-cut using one of the old school cutting boards, the cards are slightly smaller than normal cards." 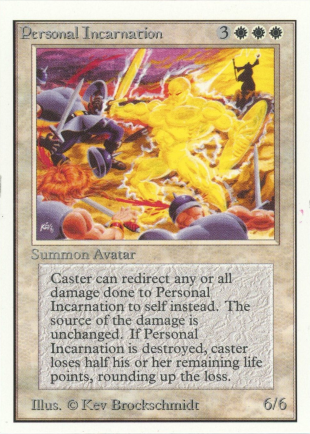 QUESTION: Dave, I'd love to hear your thoughts on this card. 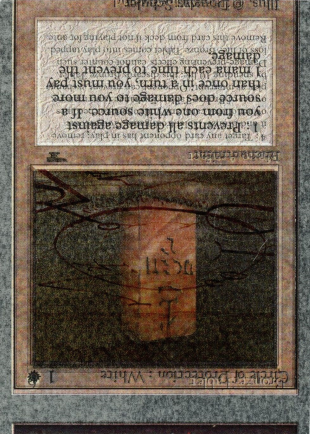 It seems to be an Unlimited card & an Antiquities card printed on top of each other. 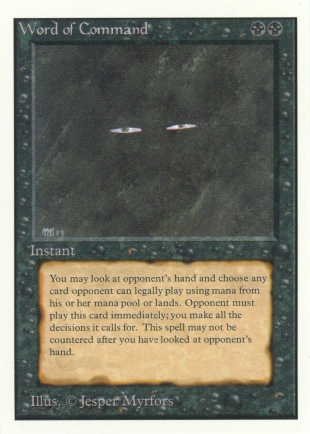 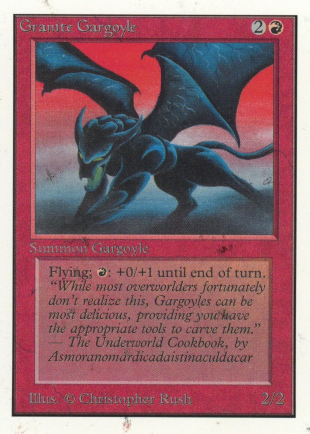 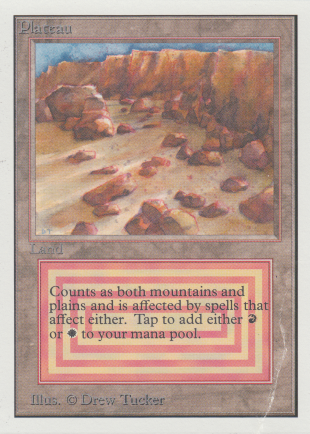 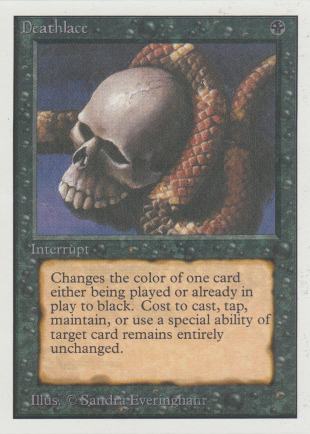 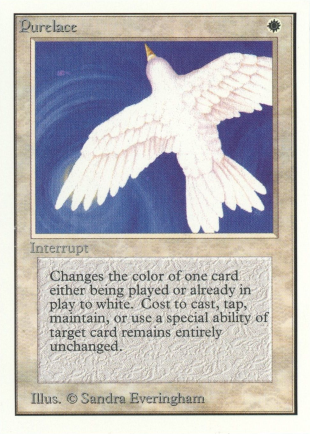 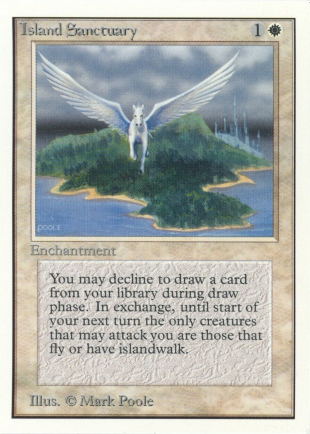 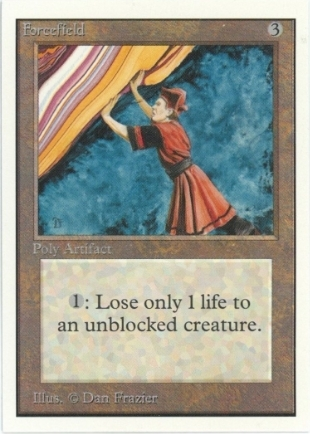 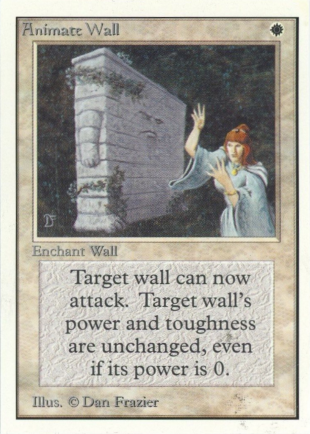 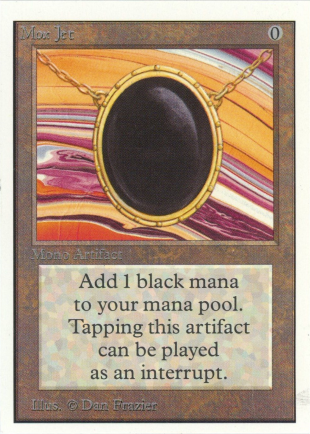 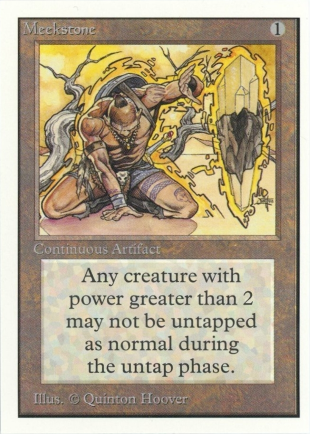 Could this have anything to do with the idea of gray bordered Unlimited that you mentioned above? 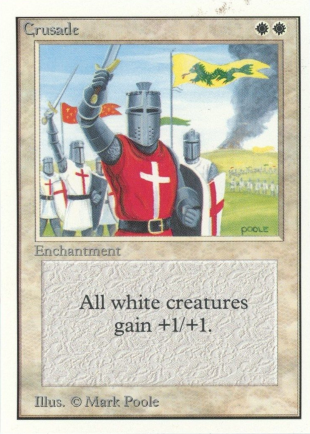 Dave Howell: The overprinted card: no, not a gray test. 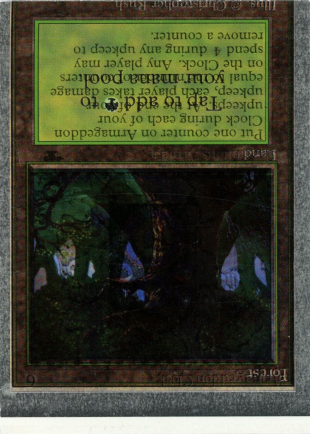 I think that's just somebody accidentally feeding a finished Unlimited sheet through the printing press. 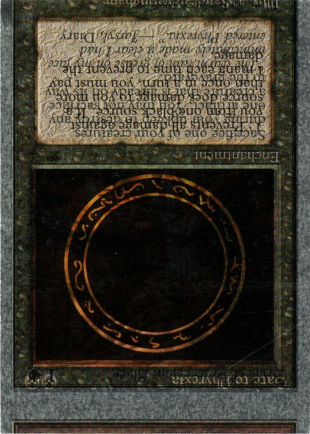 Since Unlt was white and Ant was black border, the black was being printed onto the paper AFTER the clear varnish coat had been applied. 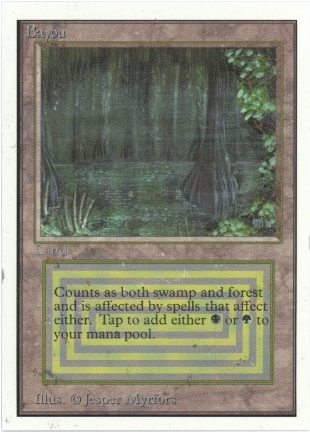 Result: the ink was repelled, causing it to bead up, creating that weird grayish mottled look. 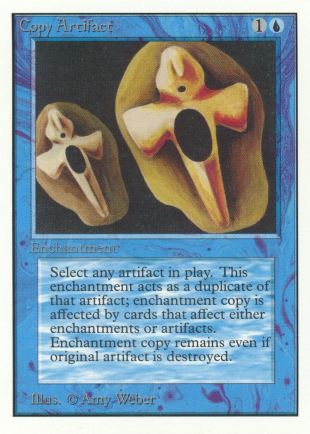 Those are the rarest ones, less than 20 cards are known to exist. 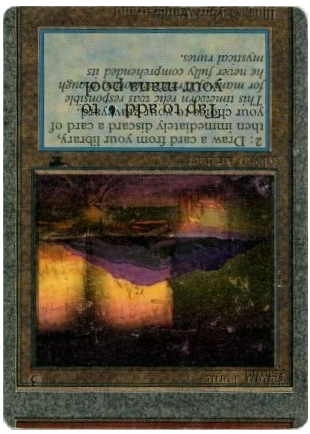 Some of these cards with glue on the back went under a restoration process in 2008 and 2011 in order to remove the glue. 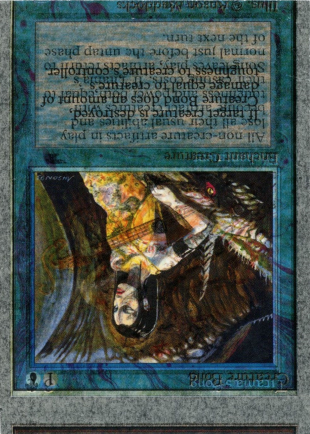 Badlands Unlimited Front with Mesa Pegasus Unlimited / Martyrs of Korlis Antiquities upside down back round corners. 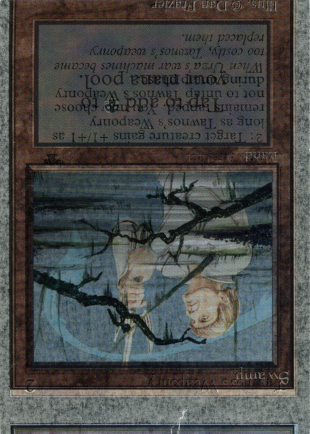 Restored. 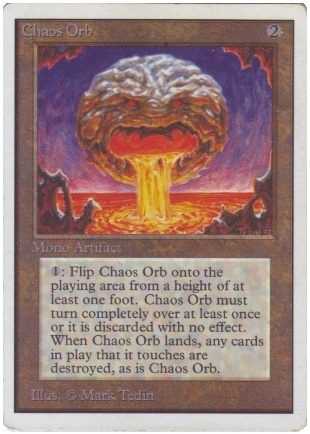 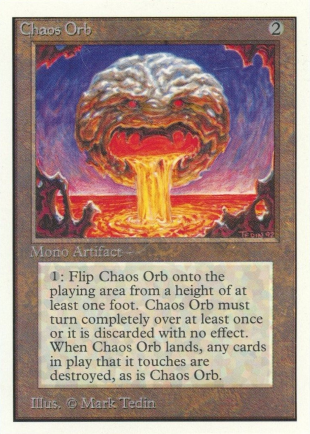 Chaos Orb Unlimited Front with Island Version 1 Unlimited / Weakstone Antiquities upside down back round corners. 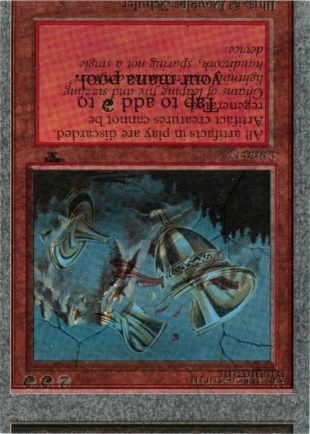 Forcefield Unlimited Front with Raise Dead Unlimited / Wall of Spears Antiquities upside down back round corners. 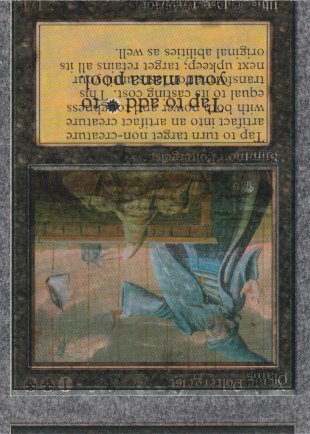 Lich Unlimited Front with Tranquility Unlimited / Martyrs of Korlis Antiquities upside down back square corners (It was the only card square cornered from the first sheet). 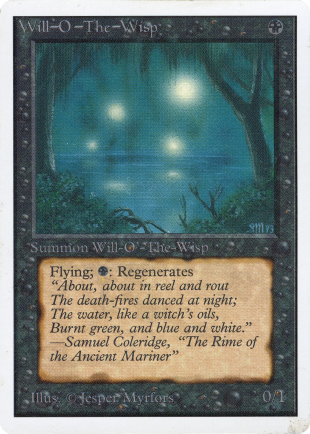 Mana Flare Unlimited with Forest Version 2 Unlimited / Energy Flux Antiquities upside down back round corners. 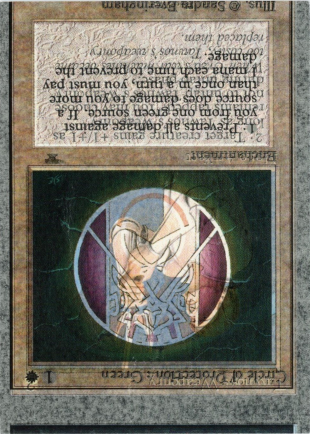 Restored. 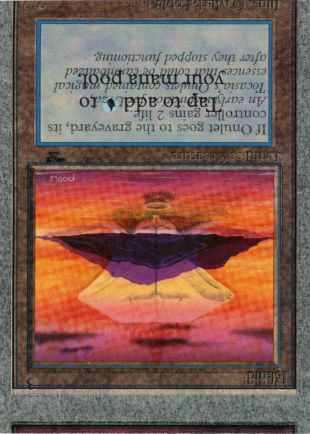 Natural Selection Unlimited Front with Pearled Unicorn Unlimited / Citanul Druid Antiquities upside down back round corners. 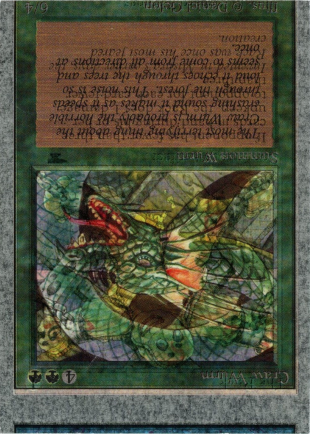 Shivan Dragon Unlimited Front with Swamp Version 1 Unlimited / Mishra's War Machine Antiquities upside down back round corners. 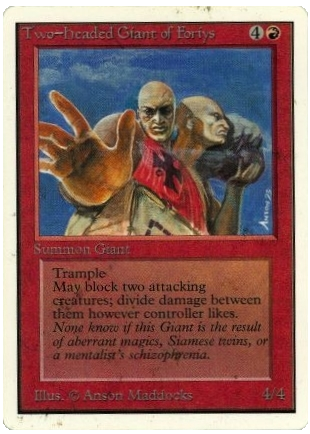 Two-Headed Giant of Foriys Unlimited Front with Island Version 2 Unlimited / Jalum Tome Antiquities upside down back round corners. 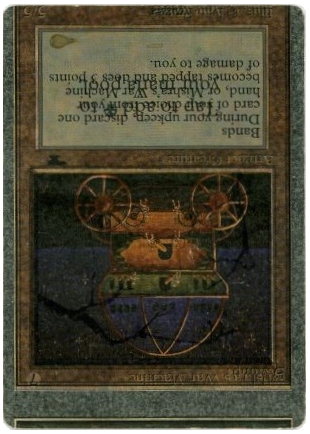 Wheel of Fortune Unlimited with Death Ward Unlimited / Energy Flux Antiquities upside down back round corners. 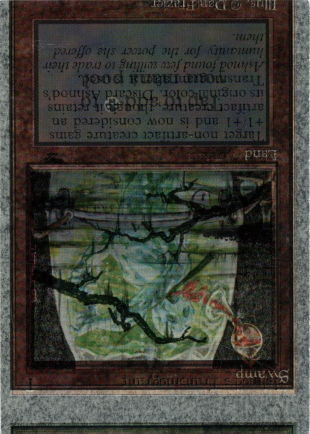 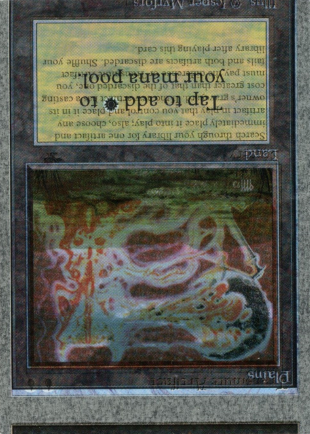 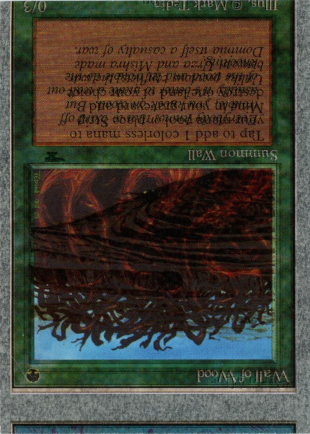 Will-o'-the-Wisp Unlimited with Sinkhole Unlimited / Gate to Phyrexia Antiquities upside down back round corners. 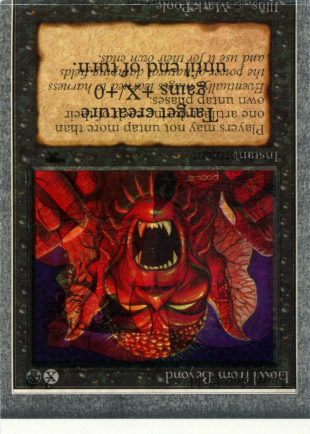 Restored. 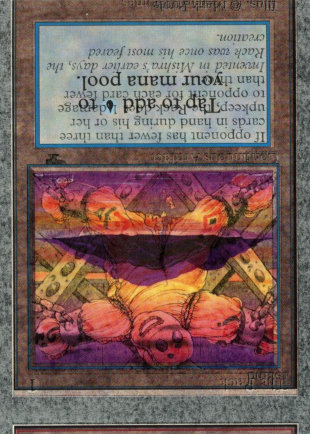 Fork Unlimited with Unholy Strength Unlimited / Su-Chi Antiquities upside down back round corners Restored. 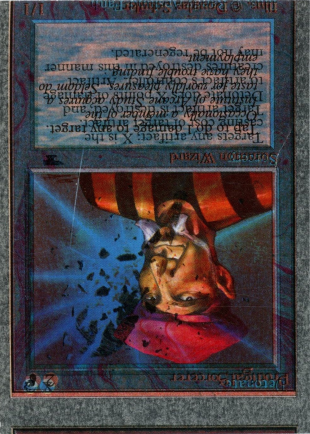 Scan to be upgraded. 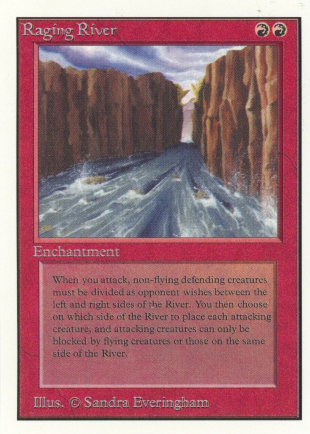 Raging River Unlimited with Earthbind Unlimited / Tawnos's Wand Antiquities upside down back round corners Restored. 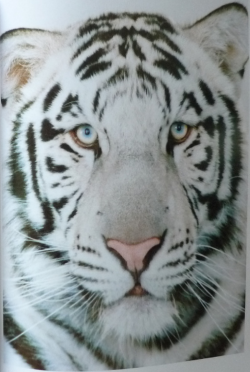 Scan to be upgraded. 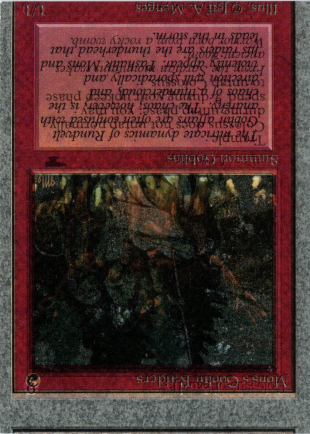 Scrubland Unlimited with Red Elemental Blast Unlimited / Yawgmoth Demon Antiquities upside down back round corners Restored. 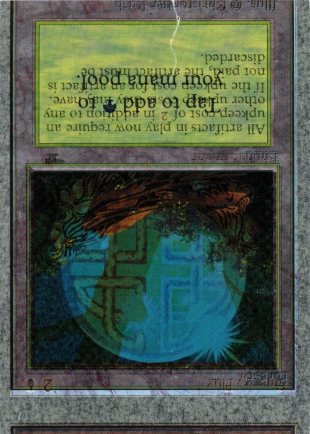 Scan to be upgraded. 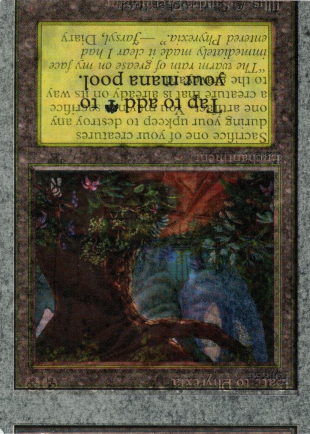 Tropical Island Unlimited with Wild Growth Unlimited / Primal Clay Antiquities upside down back round corners Restored. 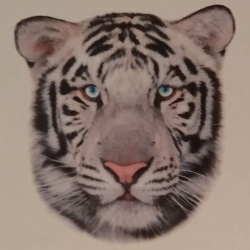 Scan to be upgraded. 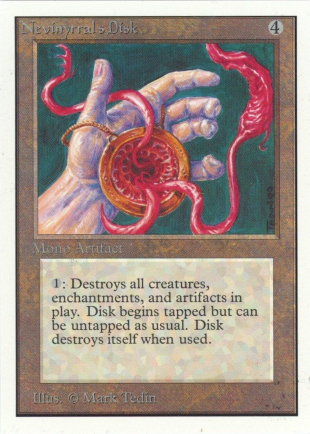 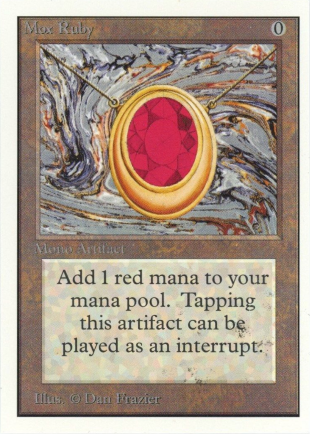 Mox Ruby Unlimited with ? 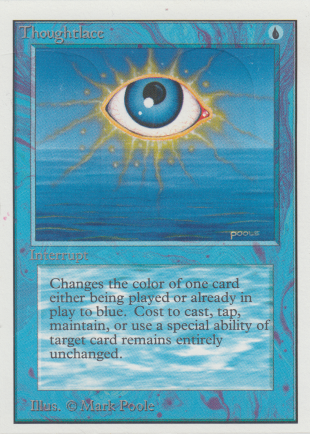 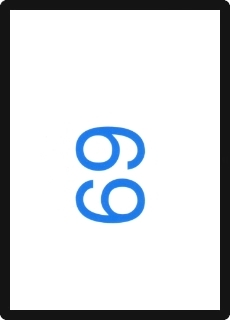 Unlimited / ? 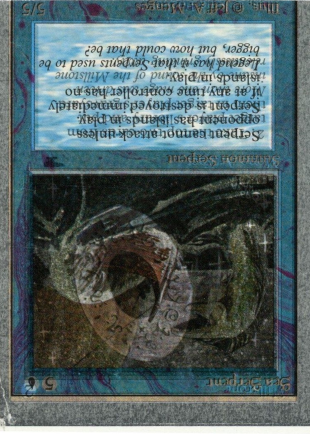 Antiquities upside down back round corners. 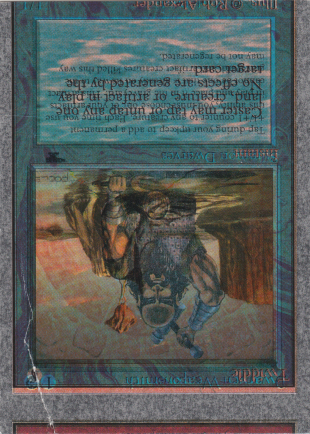 Plateau Unlimited with Twiddle Unlimited / Dwarven Weaponsmith Antiquities upside down back round corners. 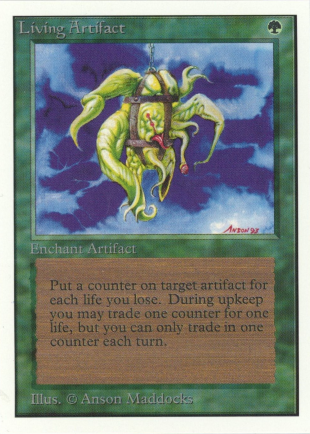 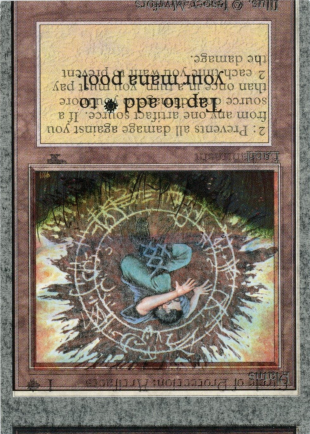 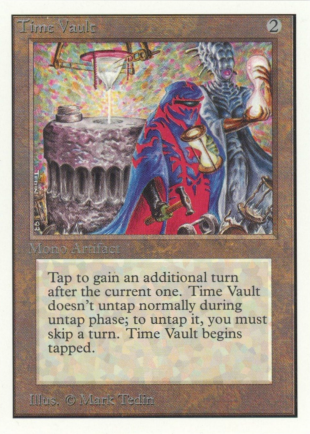 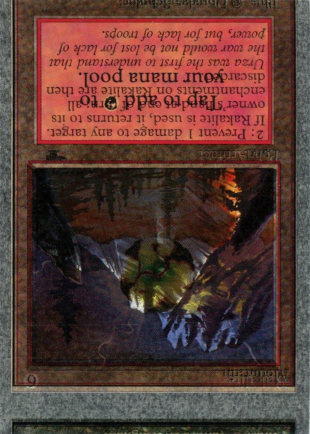 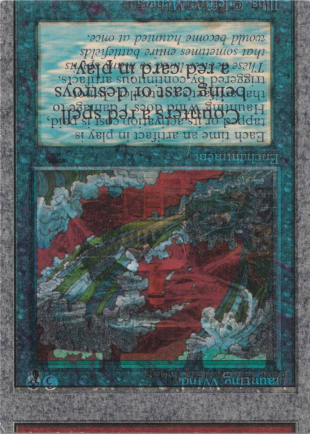 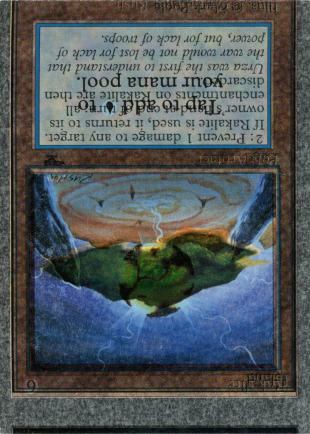 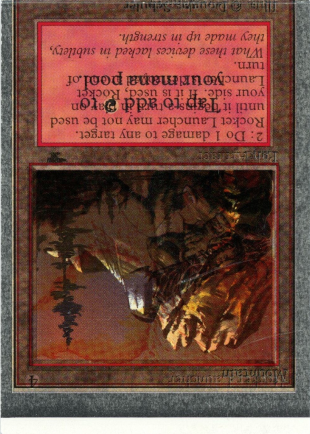 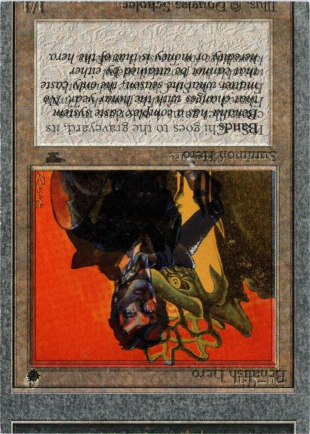 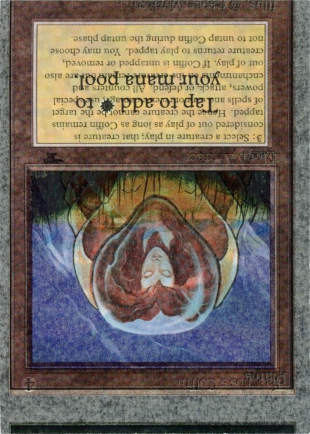 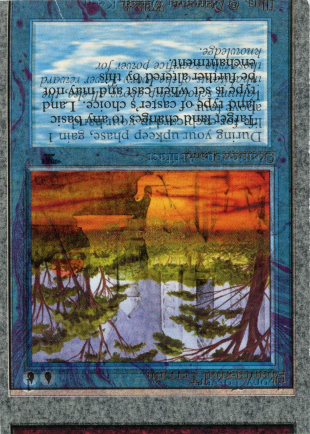 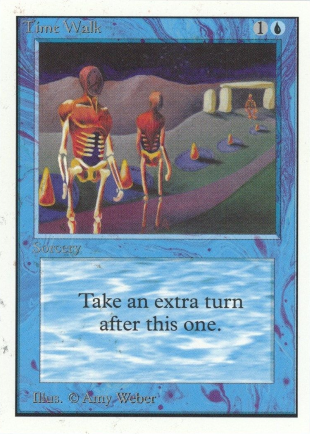 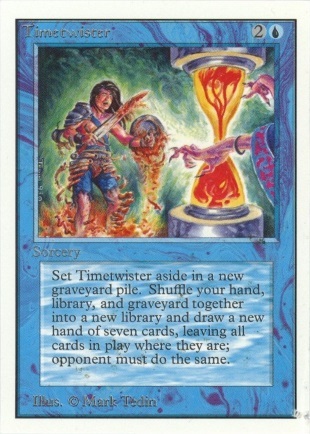 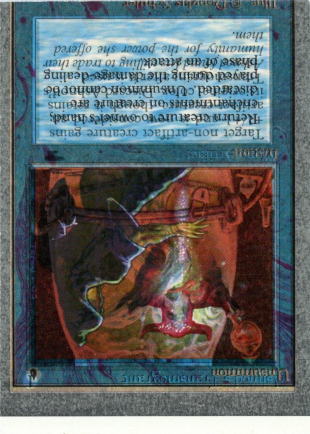 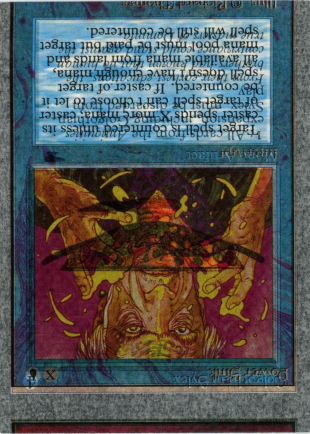 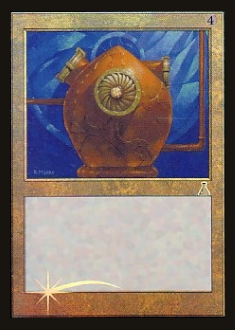 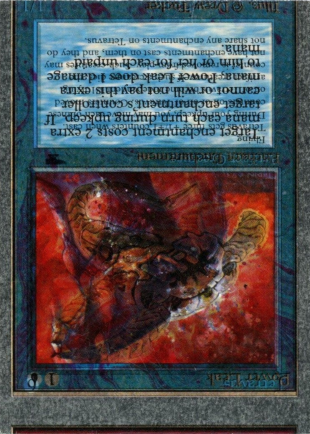 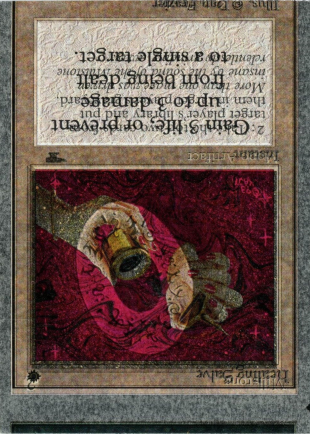 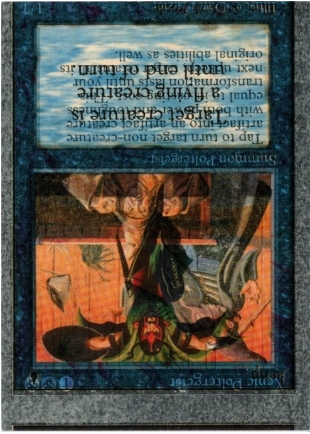 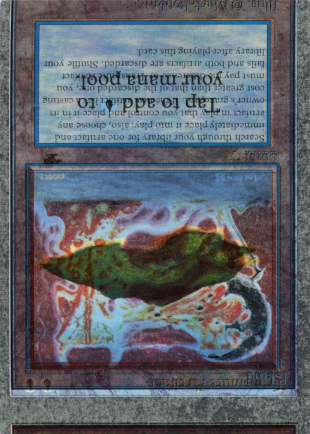 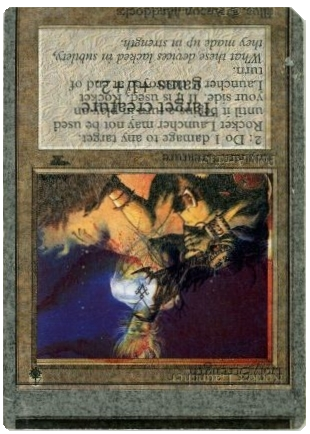 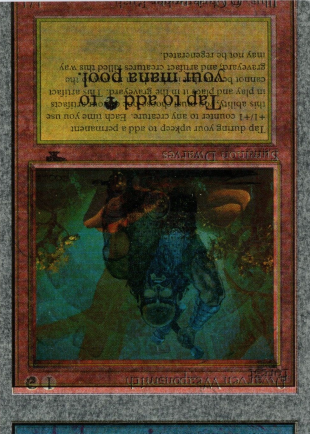 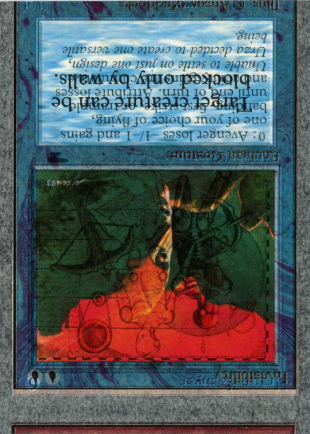 Time Vault Unlimited with Fear Unlimited / Mishra's Factory (Autumn) Antiquities upside down back round corners. 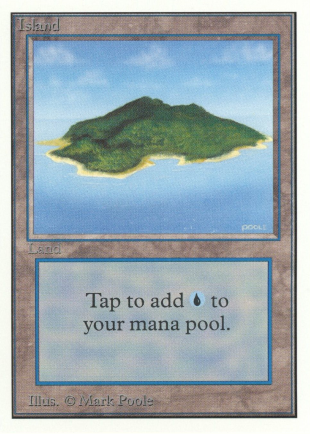 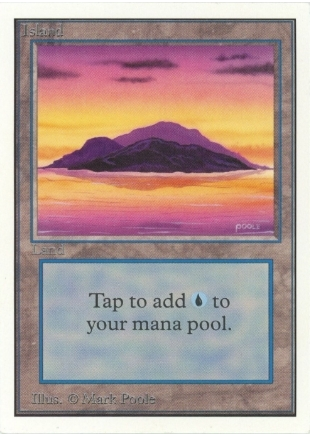 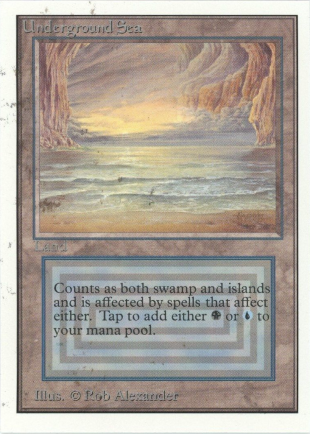 Some were still glued onto another card: Fork, Mana Flare, Raging River, Tropical Island. 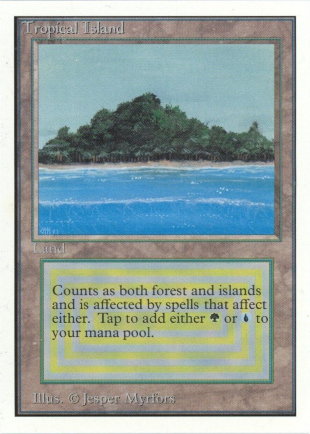 117 Rares and 4 Islands for a total of 121 cards. 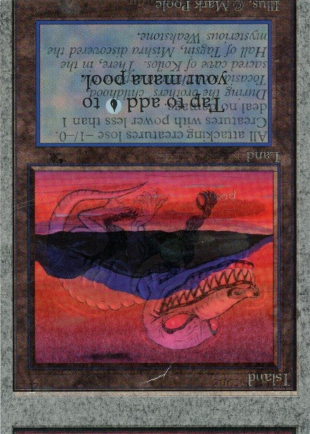 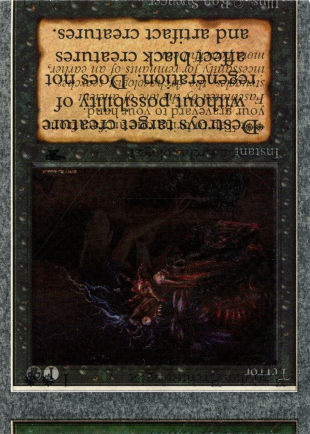 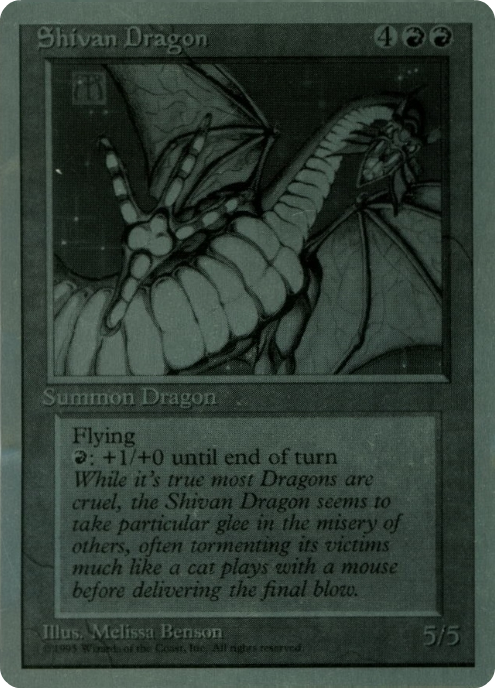 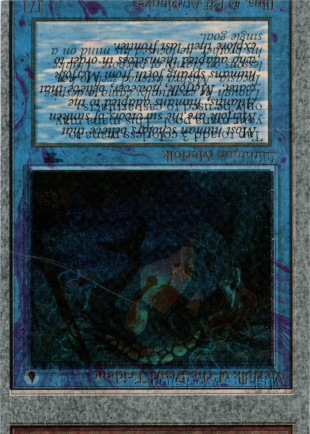 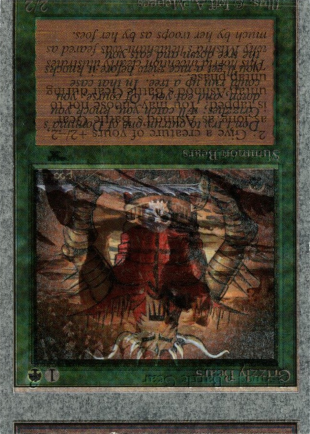 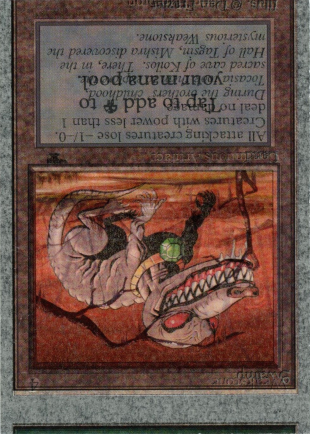 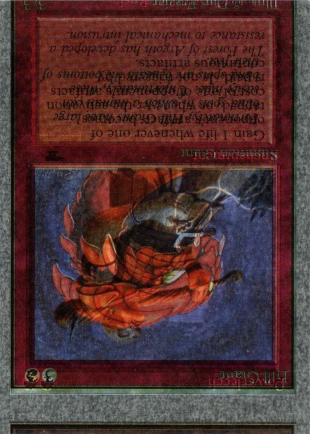 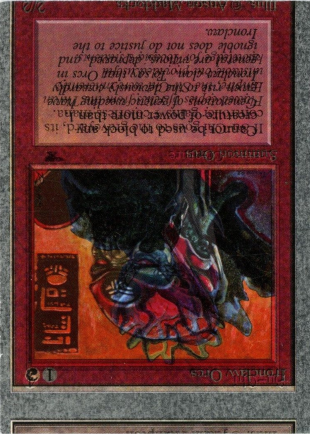 NEED SCAN: Shivan Dragon Unlimited Front with Swamp Version 1 Unlimited / Mishra's War Machine Antiquities upside down back square corners. 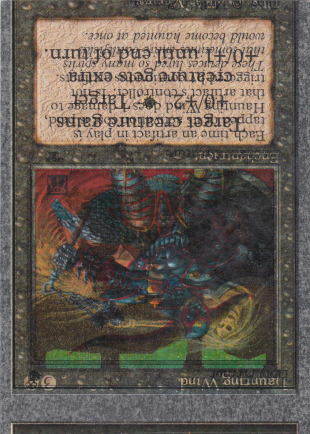 NEED SCAN: Two-Headed Giant of Foriys Unlimited Front with Island Version 2 Unlimited / Jalum Tome Antiquities upside down back square corners. 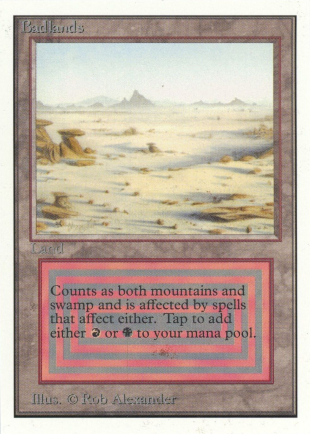 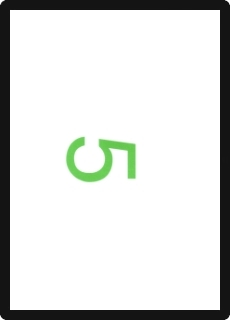 The entire set (C/U/R) exist with round corners, (C/U/R) exist as well with square corners. 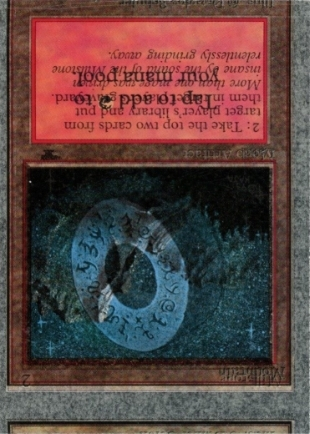 The Foil Textless Urza's Destiny cards that are found on the secondary market, are from Foil Urza's Destiny sheets, all the cards have the Urza's Destiny symbol. 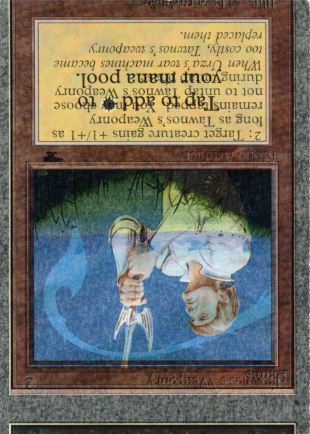 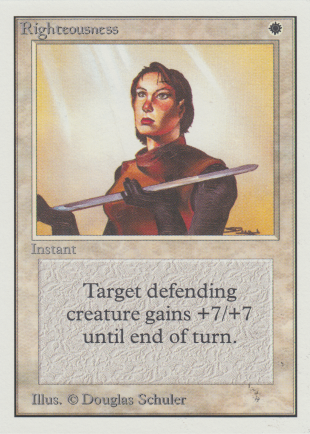 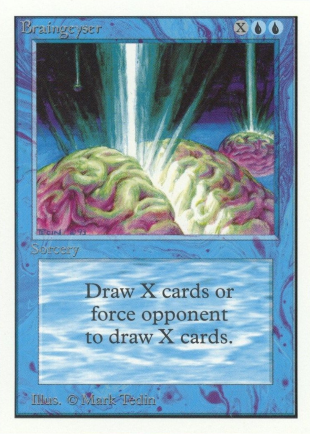 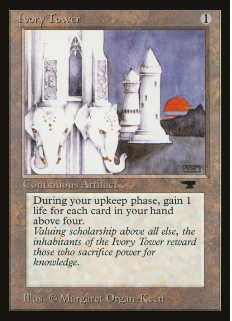 After this test, the expansion foil program was started with Urza's Legacy. 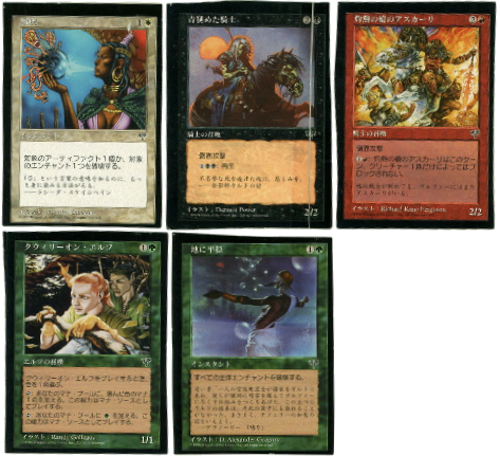 French, German, Italian, Japanese, Portuguese and Spanish. 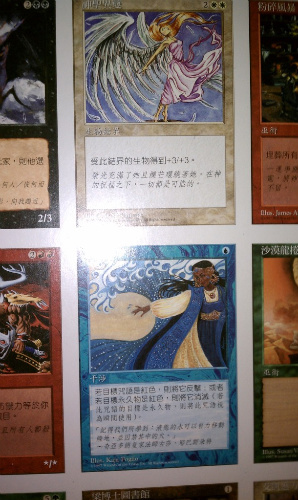 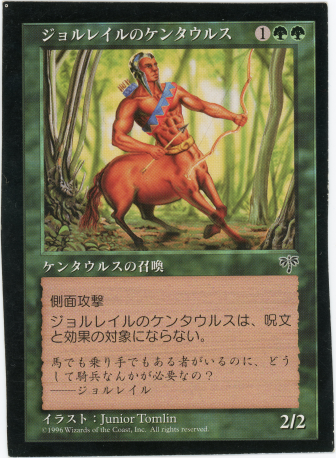 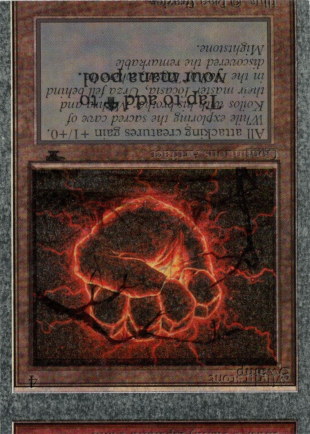 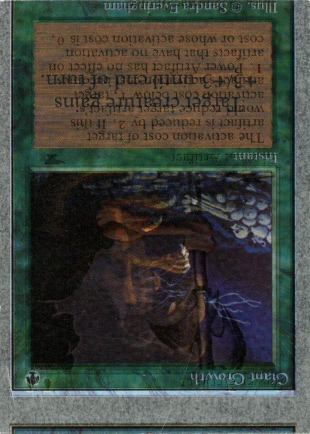 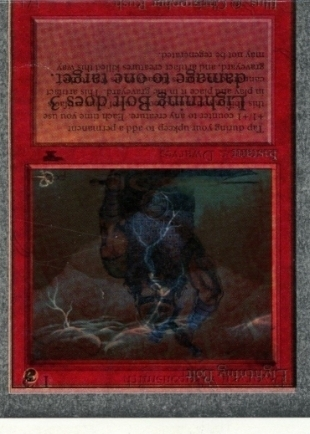 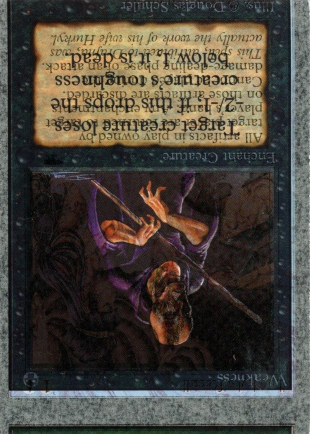 The textless foil Lighting Bolt and Serra Avatar are one of few textless cards which had been added to Japanese Urza's Destiny print sheets. 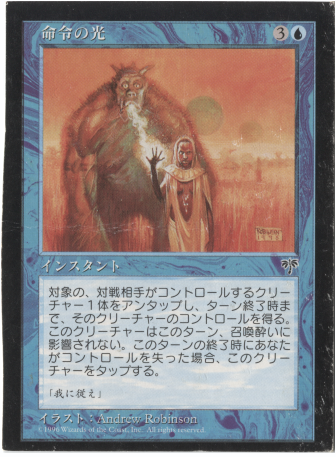 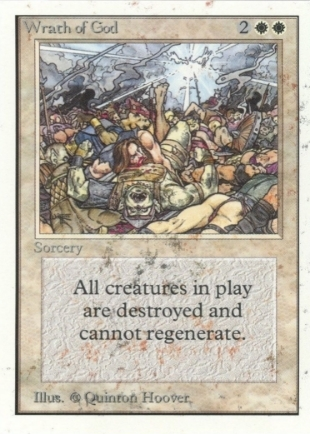 While most of them were destroyed, a handful of them survived and were erroneously distributed in Japanese Urza's Destiny boosters.